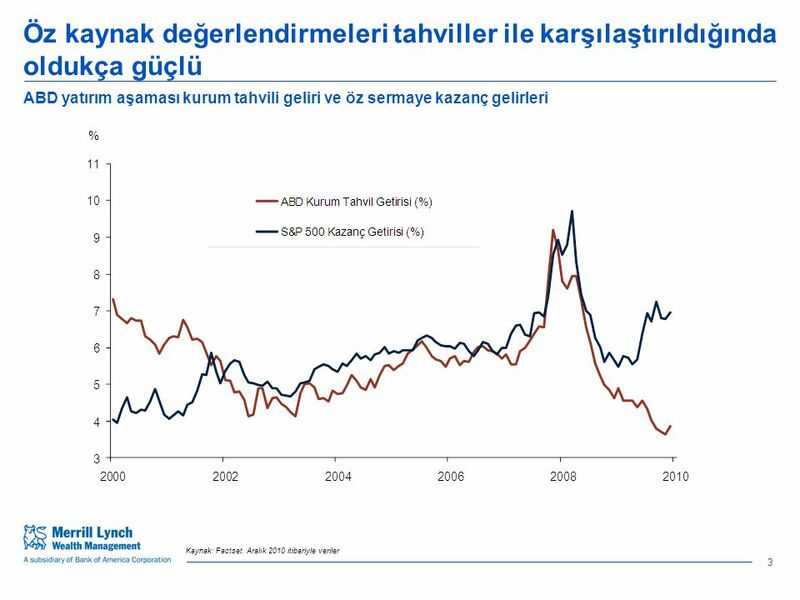 Johannes Jooste – Yatırımlardan Sorumlu Direktör Global Wealth Management, Avrupa, Ortadoğu ve Afrika Ocak 2011 2011 Yılında Yatırım Stratejilerine Genel. 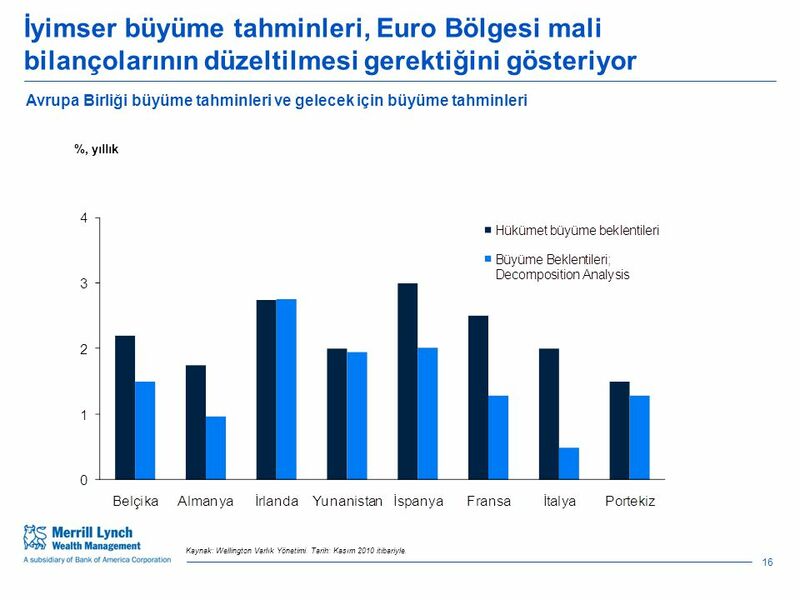 16 İyimser büyüme tahminleri, Euro Bölgesi mali bilançolarının düzeltilmesi gerektiğini gösteriyor Avrupa Birliği büyüme tahminleri ve gelecek için büyüme tahminleri %, yıllık 16 Kaynak: Wellington Varlık Yönetimi. 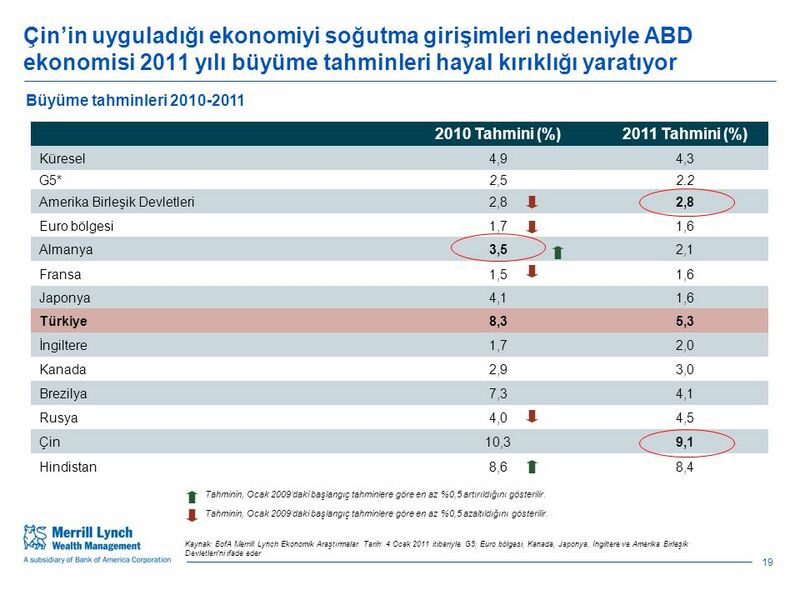 Tarih: Kasım 2010 itibariyle. 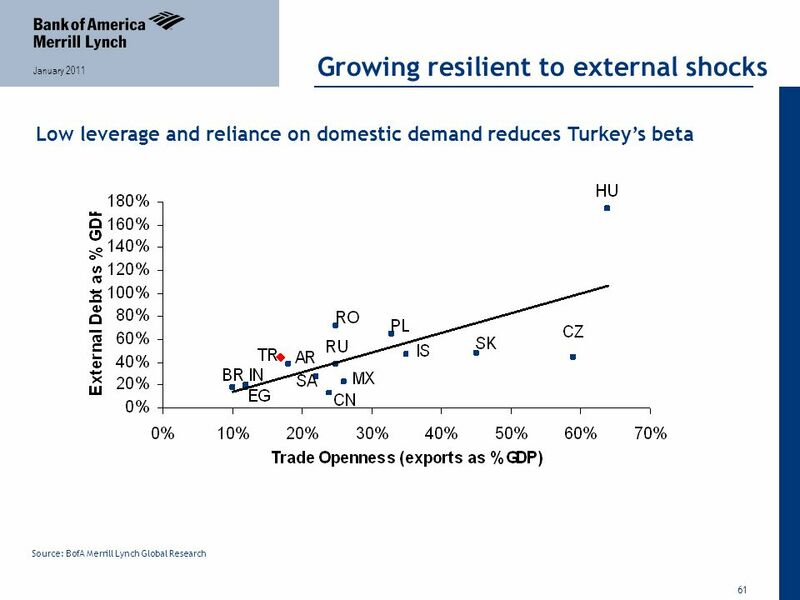 46 46 January 2011 Turker Hamzaoglu +44 20 7996 2417 EEMEA Economist MLPF&S (UK) turker.hamzaoglu@baml.com Turkey Economics 11008119 January 2011 2011 Outlook Graduation time BofA Merrill Lynch does and seeks to do business with companies covered in its research reports. As a result, investors should be aware that the firm may have a conflict of interest that could affect the objectivity of this report. Investors should consider this report as only a single factor in making their investment decision. Refer to important disclosures on page 33-34. 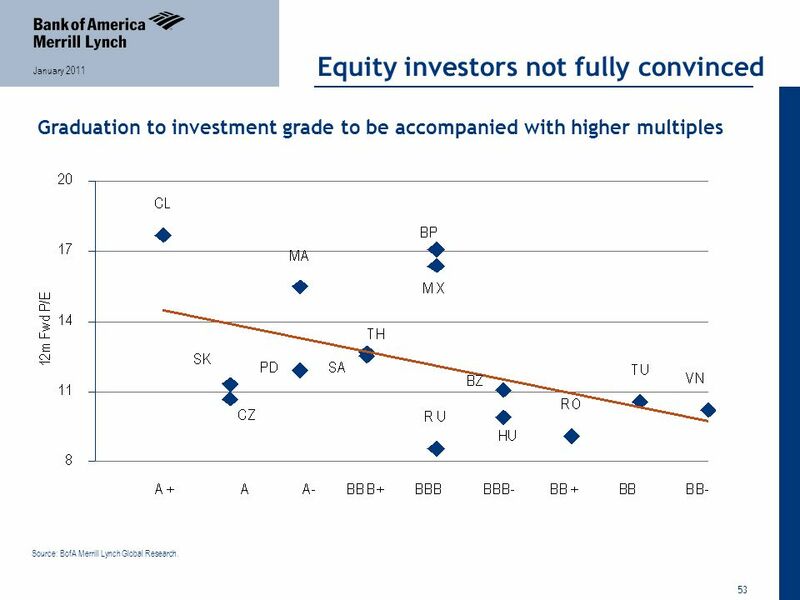 53 53 January 2011 Equity investors not fully convinced Graduation to investment grade to be accompanied with higher multiples Source: BofA Merrill Lynch Global Research. 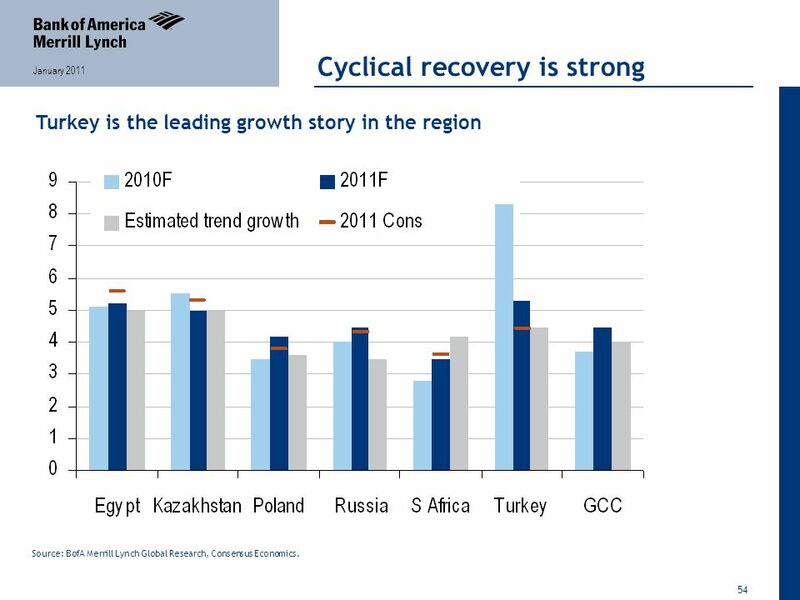 54 54 January 2011 Cyclical recovery is strong Turkey is the leading growth story in the region Source: BofA Merrill Lynch Global Research, Consensus Economics. 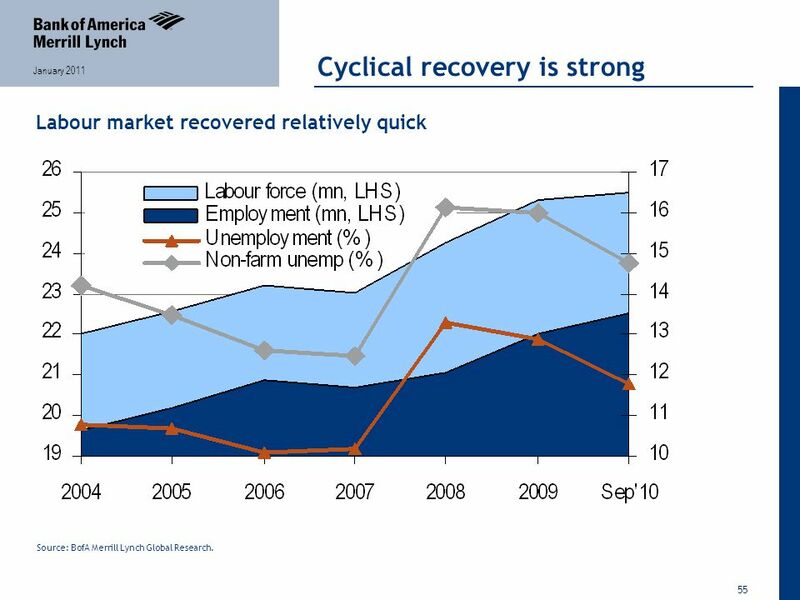 55 55 January 2011 Cyclical recovery is strong Labour market recovered relatively quick Source: BofA Merrill Lynch Global Research. 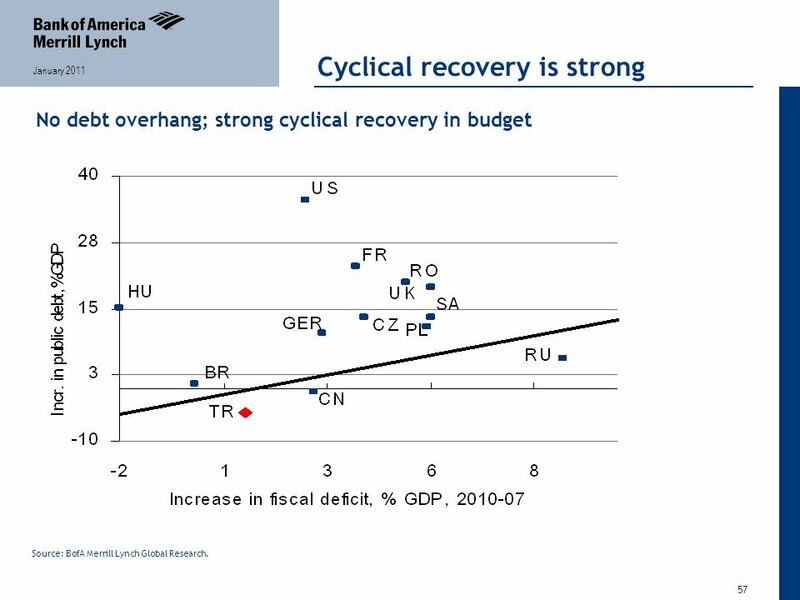 57 57 January 2011 Cyclical recovery is strong No debt overhang; strong cyclical recovery in budget Source: BofA Merrill Lynch Global Research. 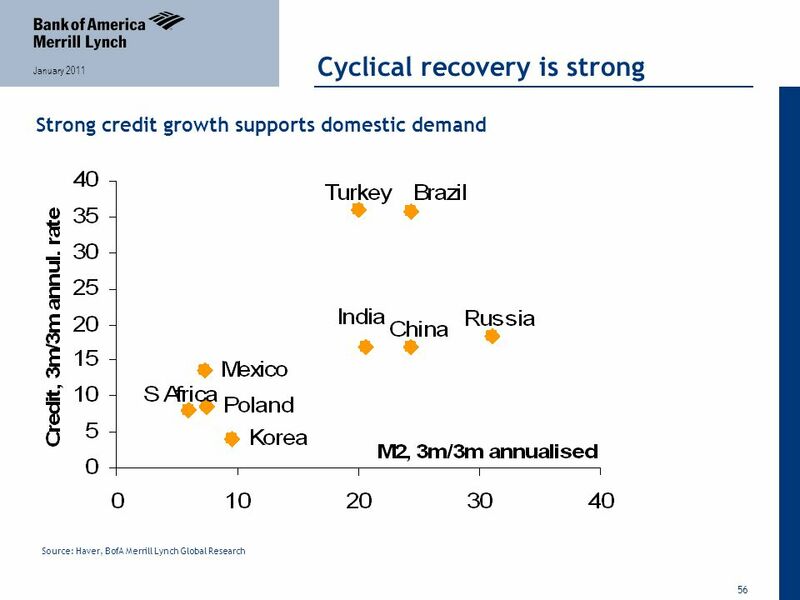 59 59 January 2011 Macro fundamentals have improved Source: BofA Merrill Lynch Global Research. 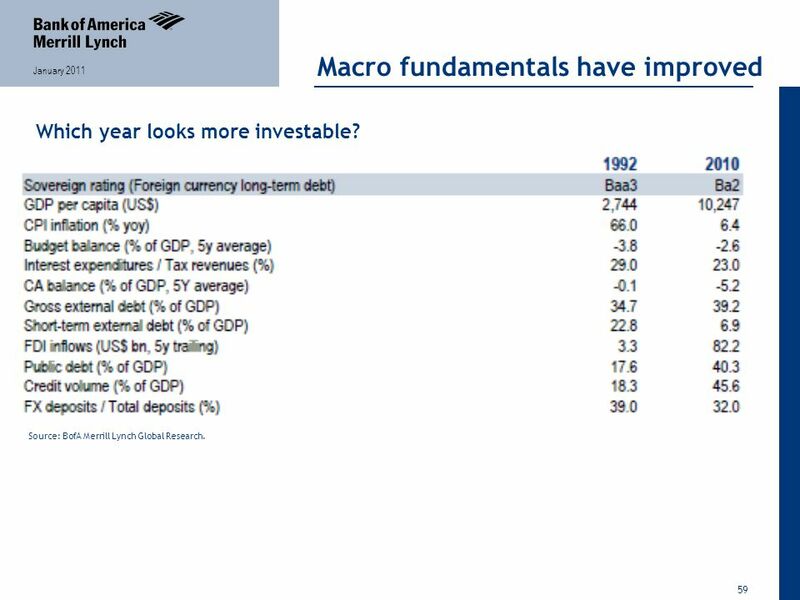 Which year looks more investable? 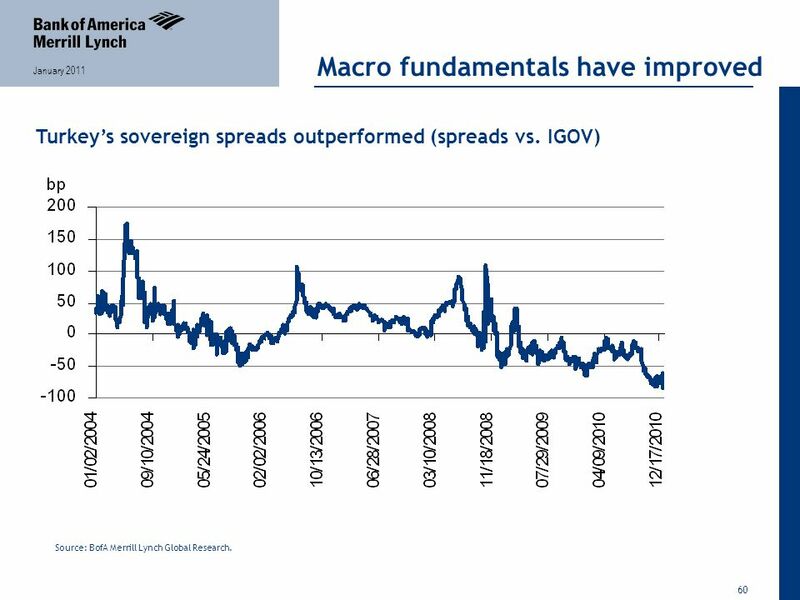 60 60 January 2011 Macro fundamentals have improved Turkey’s sovereign spreads outperformed (spreads vs. IGOV) Source: BofA Merrill Lynch Global Research. 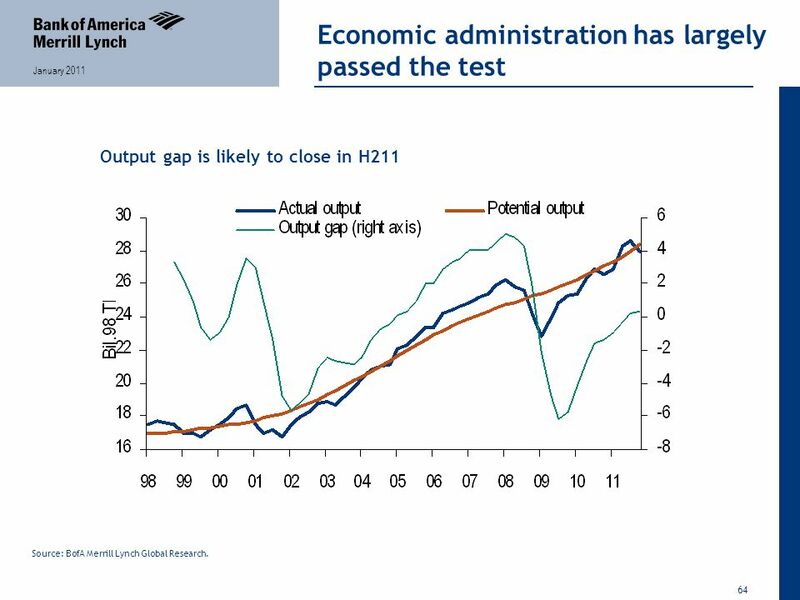 64 64 January 2011 Economic administration has largely passed the test Output gap is likely to close in H211 Source: BofA Merrill Lynch Global Research. 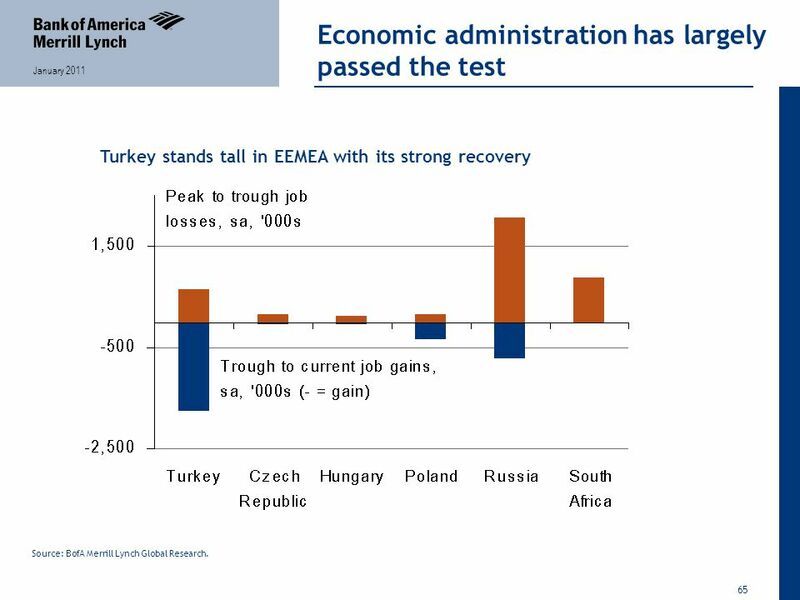 65 65 January 2011 Economic administration has largely passed the test Turkey stands tall in EEMEA with its strong recovery Source: BofA Merrill Lynch Global Research. 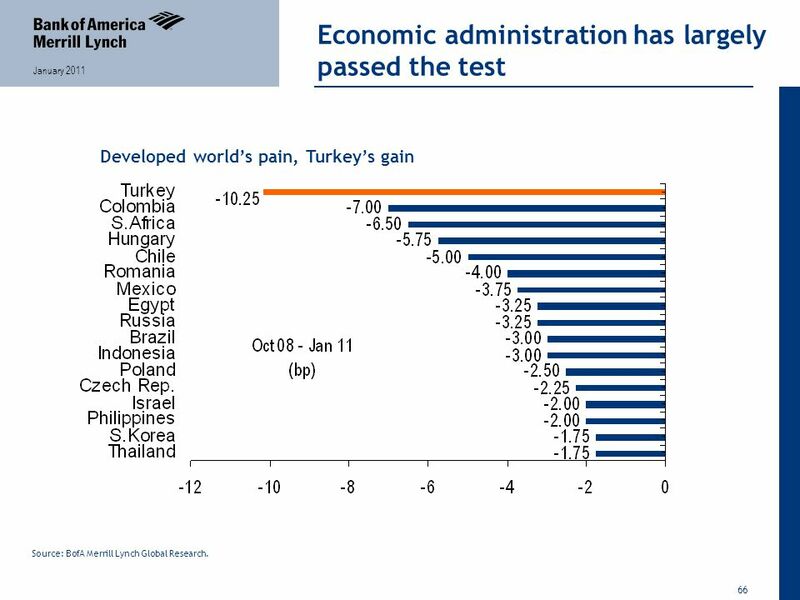 66 66 January 2011 Economic administration has largely passed the test Developed world’s pain, Turkey’s gain Source: BofA Merrill Lynch Global Research. 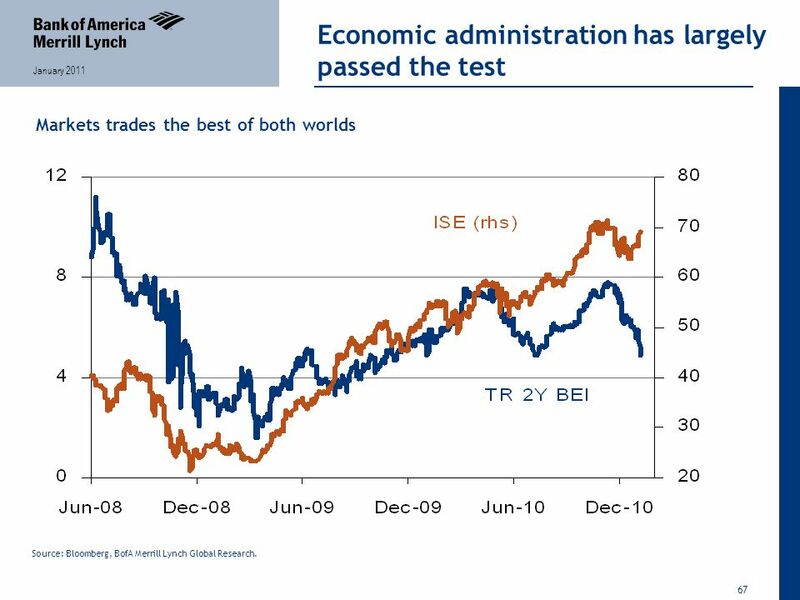 67 67 January 2011 Economic administration has largely passed the test Markets trades the best of both worlds Source: Bloomberg, BofA Merrill Lynch Global Research. 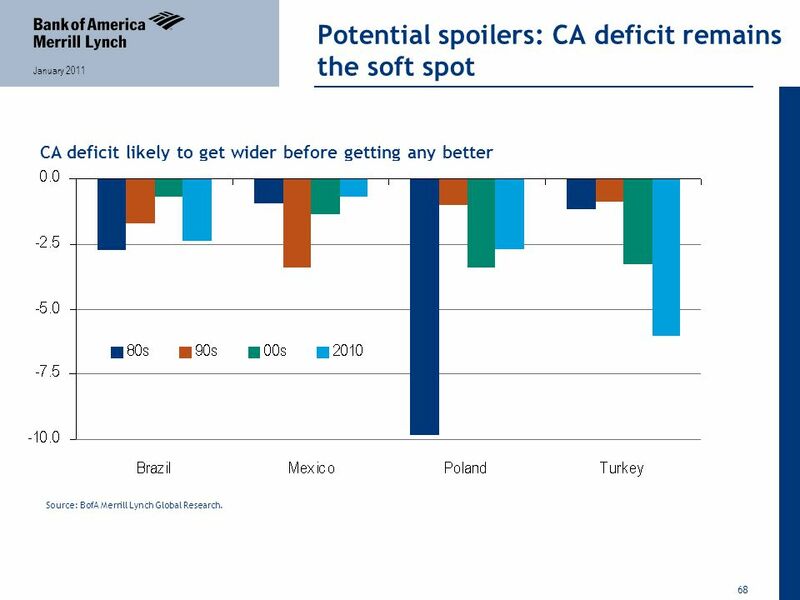 68 68 January 2011 Potential spoilers: CA deficit remains the soft spot CA deficit likely to get wider before getting any better Source: BofA Merrill Lynch Global Research. 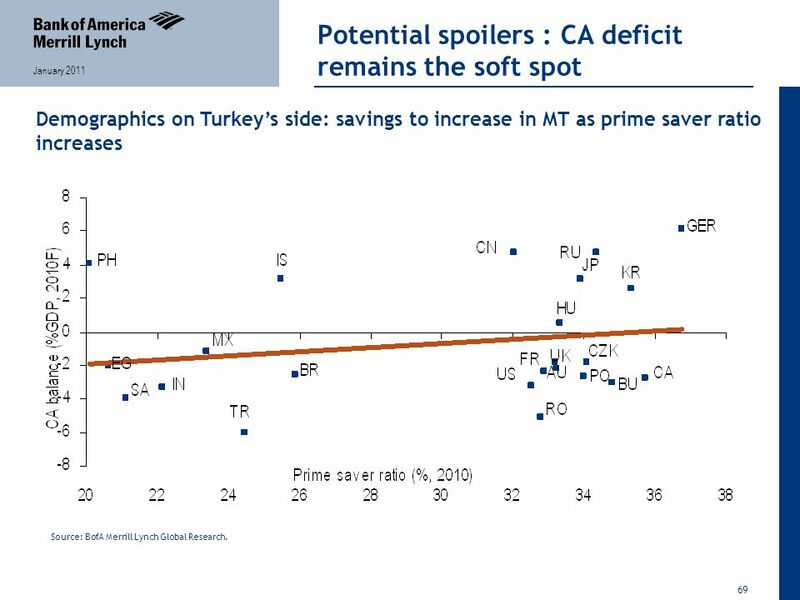 69 69 January 2011 Potential spoilers : CA deficit remains the soft spot Demographics on Turkey’s side: savings to increase in MT as prime saver ratio increases Source: BofA Merrill Lynch Global Research. 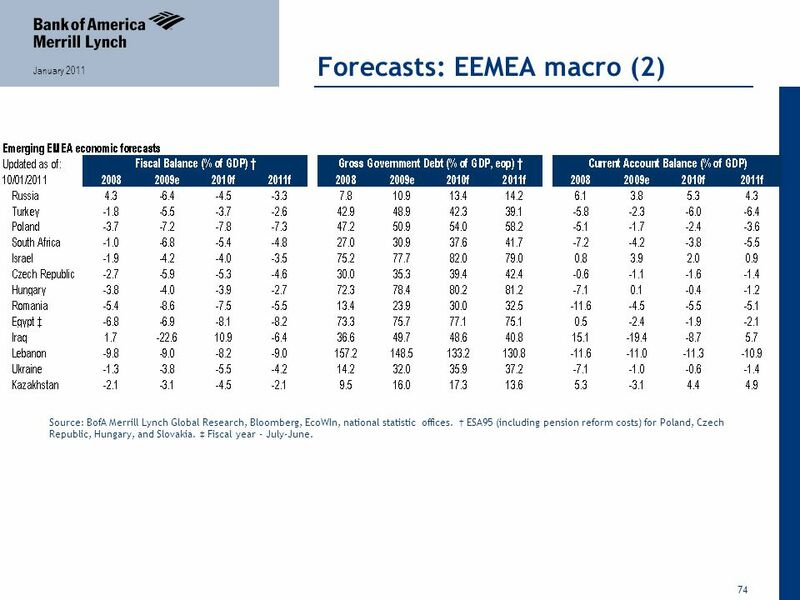 73 73 January 2011 Forecasts: EEMEA macro (1) Source: BofA Merrill Lynch Global Research, Bloomberg, EcoWIn, national statistics offices. ‡ Fiscal year - July-June. 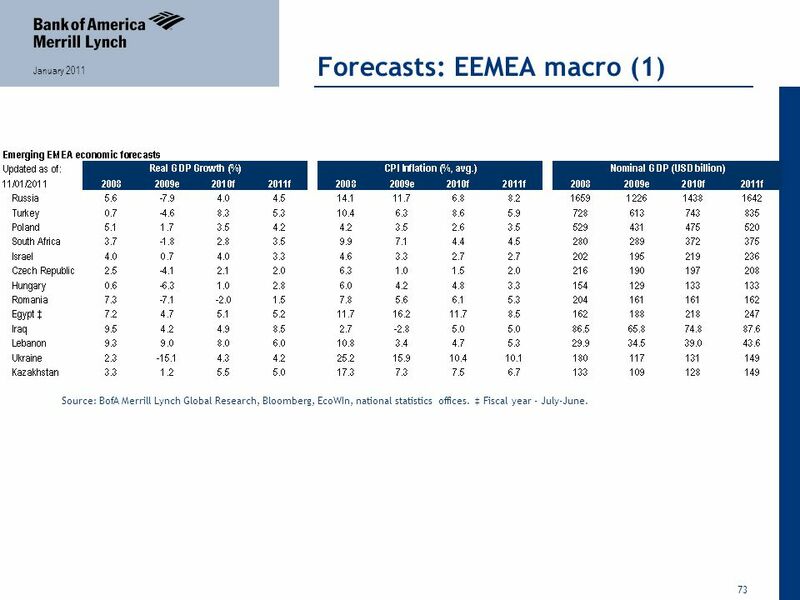 74 74 January 2011 Forecasts: EEMEA macro (2) Source: BofA Merrill Lynch Global Research, Bloomberg, EcoWIn, national statistic offices. † ESA95 (including pension reform costs) for Poland, Czech Republic, Hungary, and Slovakia. ‡ Fiscal year - July-June. 75 75 January 2011 Important Disclosures Due to the nature of strategic analysis, the issuers or securities recommended or discussed in this report are not continuously followed. 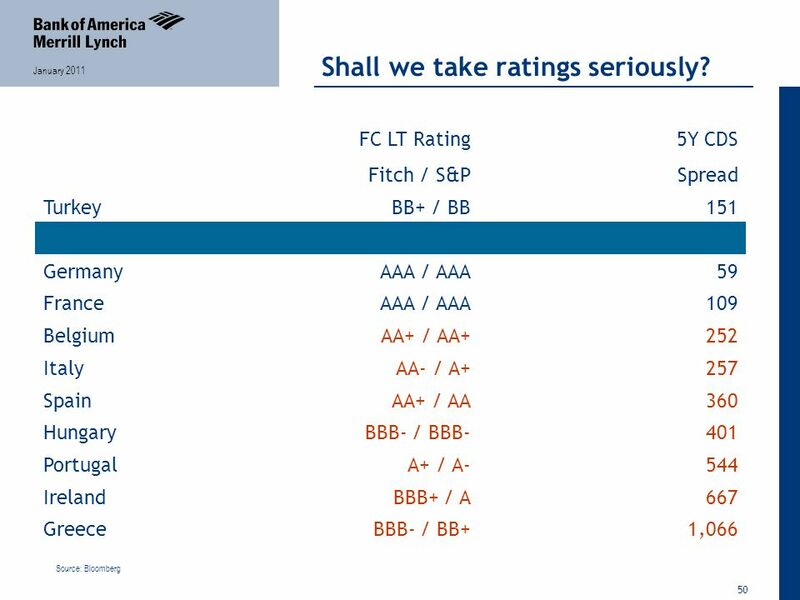 Accordingly, investors must regard this report as providing stand-alone analysis and should not expect continuing analysis or additional reports relating to such issuers and/or securities. 76 76 January 2011 Other Important Disclosures BofA Merrill Lynch Global Research policies relating to conflicts of interest are described at http://www.ml.com/media/43347.pdf. "BofA Merrill Lynch" includes Merrill Lynch, Pierce, Fenner & Smith Incorporated ("MLPF&S") and its affiliates. 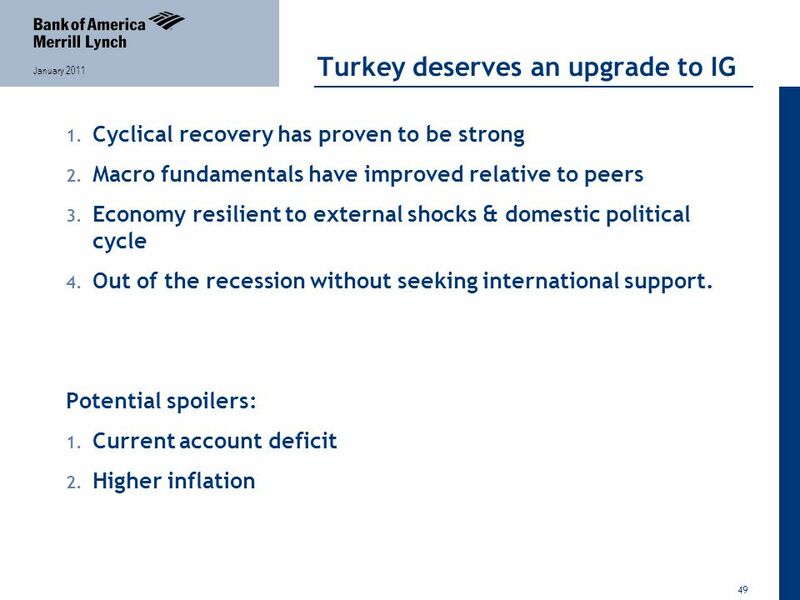 Investors should contact their BofA Merrill Lynch representative or Merrill Lynch Global Wealth Management financial advisor if they have questions concerning this report. Information relating to Non-US affiliates of BofA Merrill Lynch and Distribution of Affiliate Research Reports: MLPF&S distributes, or may in the future distribute, research reports of the following non-US affiliates in the US (short name: legal name): Merrill Lynch (France): Merrill Lynch Capital Markets (France) SAS; Merrill Lynch (Frankfurt): Merrill Lynch International Bank Ltd., Frankfurt Branch; Merrill Lynch (South Africa): Merrill Lynch South Africa (Pty) Ltd.; Merrill Lynch (Milan): Merrill Lynch International Bank Limited; MLI (UK): Merrill Lynch International; Merrill Lynch (Australia): Merrill Lynch Equities (Australia) Limited; Merrill Lynch (Hong Kong): Merrill Lynch (Asia Pacific) Limited; Merrill Lynch (Singapore): Merrill Lynch (Singapore) Pte Ltd.; Merrill Lynch (Canada): Merrill Lynch Canada Inc; Merrill Lynch (Mexico): Merrill Lynch Mexico, SA de CV, Casa de Bolsa; Merrill Lynch (Argentina): Merrill Lynch Argentina SA; Merrill Lynch (Japan): Merrill Lynch Japan Securities Co., Ltd.; Merrill Lynch (Seoul): Merrill Lynch International Incorporated (Seoul Branch); Merrill Lynch (Taiwan): Merrill Lynch Securities (Taiwan) Ltd.; DSP Merrill Lynch (India): DSP Merrill Lynch Limited; PT Merrill Lynch (Indonesia): PT Merrill Lynch Indonesia; Merrill Lynch (Israel): Merrill Lynch Israel Limited; Merrill Lynch (Russia): Merrill Lynch CIS Limited, Moscow; Merrill Lynch (Turkey): Merrill Lynch Yatirim Bankasi A.S.; Merrill Lynch (Dubai): Merrill Lynch International, Dubai Branch; MLPF&S (Zürich rep. office): MLPF&S Incorporated Zürich representative office; Merrill Lynch (Spain): Merrill Lynch Capital Markets Espana, S.A.S.V. ; Merrill Lynch (Brazil): Banco Merrill Lynch de Investimentos S.A. This research report has been approved for publication and is distributed in the United Kingdom to professional clients and eligible counterparties (as each is defined in the rules of the Financial Services Authority) by Merrill Lynch International and Banc of America Securities Limited (BASL), which are authorized and regulated by the Financial Services Authority and has been approved for publication and is distributed in the United Kingdom to retail clients (as defined in the rules of the Financial Services Authority) by Merrill Lynch International Bank Limited, London Branch, which is authorized by the Central Bank of Ireland and is subject to limited regulation by the Financial Services Authority – details about the extent of its regulation by the Financial Services Authority are available from it on request; has been considered and distributed in Japan by Merrill Lynch Japan Securities Co., Ltd., a registered securities dealer under the Securities and Exchange Law in Japan; is distributed in Hong Kong by Merrill Lynch (Asia Pacific) Limited, which is regulated by the Hong Kong SFC and the Hong Kong Monetary Authority; is issued and distributed in Taiwan by Merrill Lynch Securities (Taiwan) Ltd.; is issued and distributed in India by DSP Merrill Lynch Limited; and is issued and distributed in Singapore by Merrill Lynch International Bank Limited (Merchant Bank) and Merrill Lynch (Singapore) Pte Ltd. (Company Registration No.’s F 06872E and 198602883D respectively) and Bank of America Singapore Limited (Merchant Bank). Merrill Lynch International Bank Limited (Merchant Bank) and Merrill Lynch (Singapore) Pte Ltd. are regulated by the Monetary Authority of Singapore. Merrill Lynch Equities (Australia) Limited (ABN 65 006 276 795), AFS License 235132 provides this report in Australia in accordance with section 911B of the Corporations Act 2001 and neither it nor any of its affiliates involved in preparing this research report is an Authorised Deposit-Taking Institution under the Banking Act 1959 nor regulated by the Australian Prudential Regulation Authority. No approval is required for publication or distribution of this report in Brazil. Merrill Lynch (Dubai) is authorized and regulated by the Dubai Financial Services Authority (DFSA). Research reports prepared and issued by Merrill Lynch (Dubai) are prepared and issued in accordance with the requirements of the DFSA conduct of business rules. 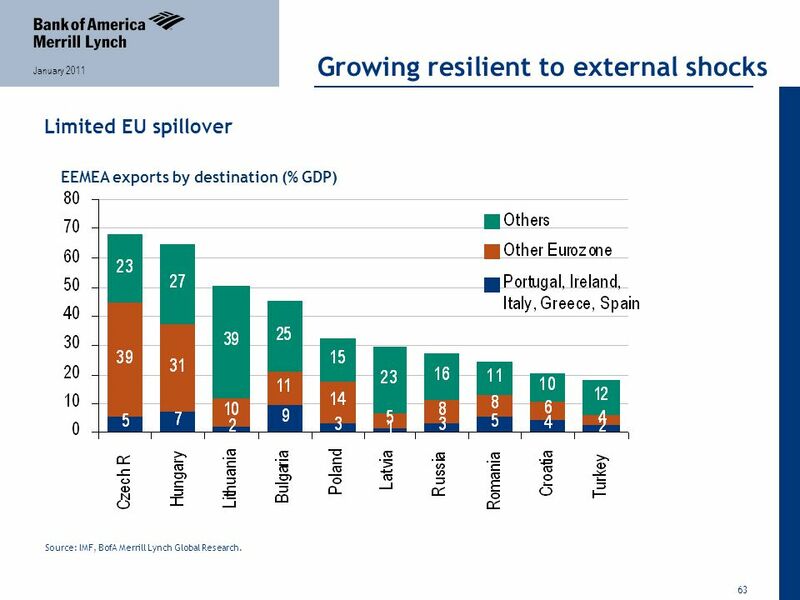 Merrill Lynch (Frankfurt) distributes this report in Germany. Merrill Lynch (Frankfurt) is regulated by BaFin. This research report has been prepared and issued by MLPF&S and/or one or more of its non-US affiliates. MLPF&S is the distributor of this research report in the US and accepts full responsibility for research reports of its non-US affiliates distributed to MLPF&S clients in the US. 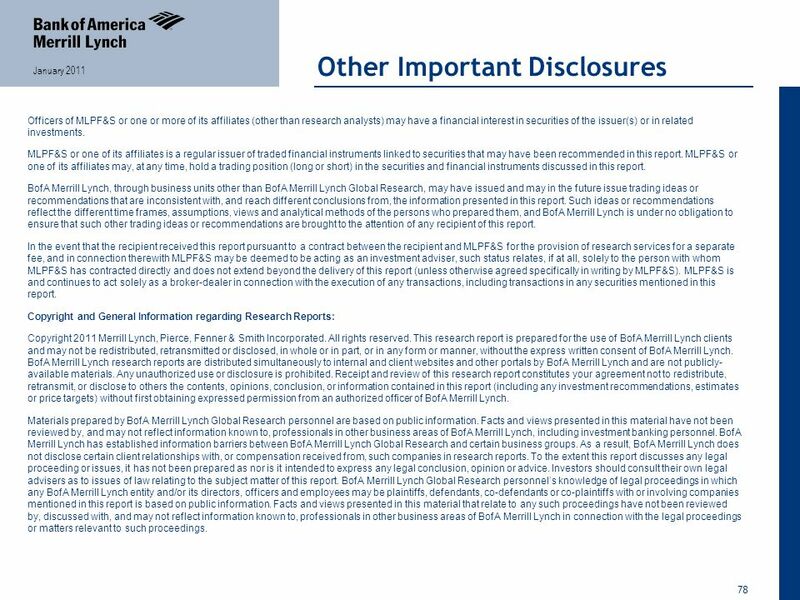 Any US person receiving this research report and wishing to effect any transaction in any security discussed in the report should do so through MLPF&S and not such foreign affiliates. 77 77 January 2011 Other Important Disclosures General Investment Related Disclosures: This research report provides general information only. Neither the information nor any opinion expressed constitutes an offer or an invitation to make an offer, to buy or sell any securities or other financial instrument or any derivative related to such securities or instruments (e.g., options, futures, warrants, and contracts for differences). This report is not intended to provide personal investment advice and it does not take into account the specific investment objectives, financial situation and the particular needs of any specific person. Investors should seek financial advice regarding the appropriateness of investing in financial instruments and implementing investment strategies discussed or recommended in this report and should understand that statements regarding future prospects may not be realized. Any decision to purchase or subscribe for securities in any offering must be based solely on existing public information on such security or the information in the prospectus or other offering document issued in connection with such offering, and not on this report. Securities and other financial instruments discussed in this report, or recommended, offered or sold by Merrill Lynch, are not insured by the Federal Deposit Insurance Corporation and are not deposits or other obligations of any insured depository institution (including, Bank of America, N.A.). Investments in general and, derivatives, in particular, involve numerous risks, including, among others, market risk, counterparty default risk and liquidity risk. No security, financial instrument or derivative is suitable for all investors. In some cases, securities and other financial instruments may be difficult to value or sell and reliable information about the value or risks related to the security or financial instrument may be difficult to obtain. Investors should note that income from such securities and other financial instruments, if any, may fluctuate and that price or value of such securities and instruments may rise or fall and, in some cases, investors may lose their entire principal investment. Past performance is not necessarily a guide to future performance. Levels and basis for taxation may change. BofA Merrill Lynch is aware that the implementation of the ideas expressed in this report may depend upon an investor's ability to "short" securities or other financial instruments and that such action may be limited by regulations prohibiting or restricting "shortselling" in many jurisdictions. Investors are urged to seek advice regarding the applicability of such regulations prior to executing any short idea contained in this report. Certain investment strategies and financial instruments discussed herein may only be appropriate for consideration in accounts qualified for high risk investment. 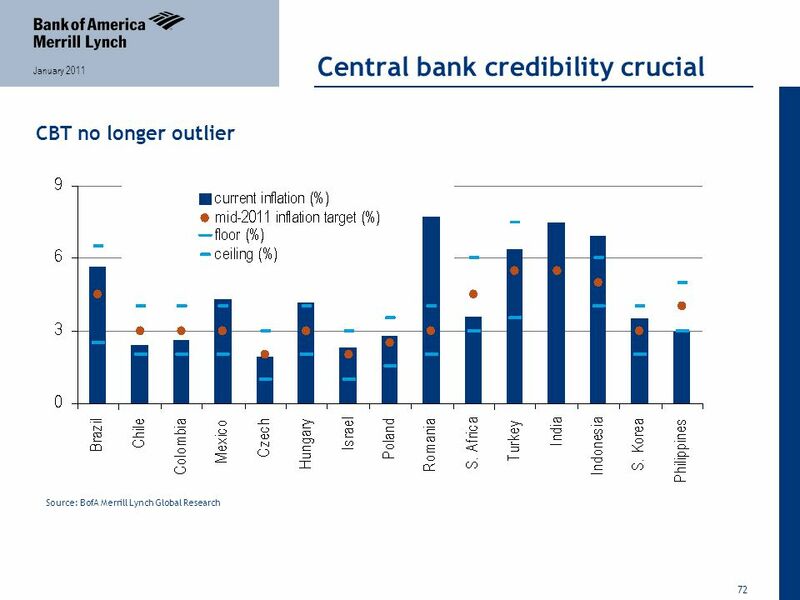 Foreign currency rates of exchange may adversely affect the value, price or income of any security or financial instrument mentioned in this report. 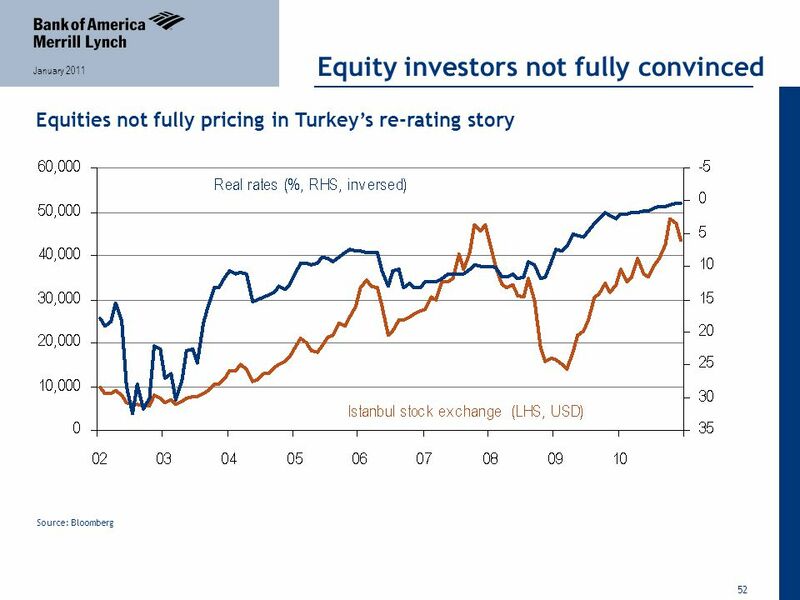 Investors in such securities and instruments effectively assume currency risk. 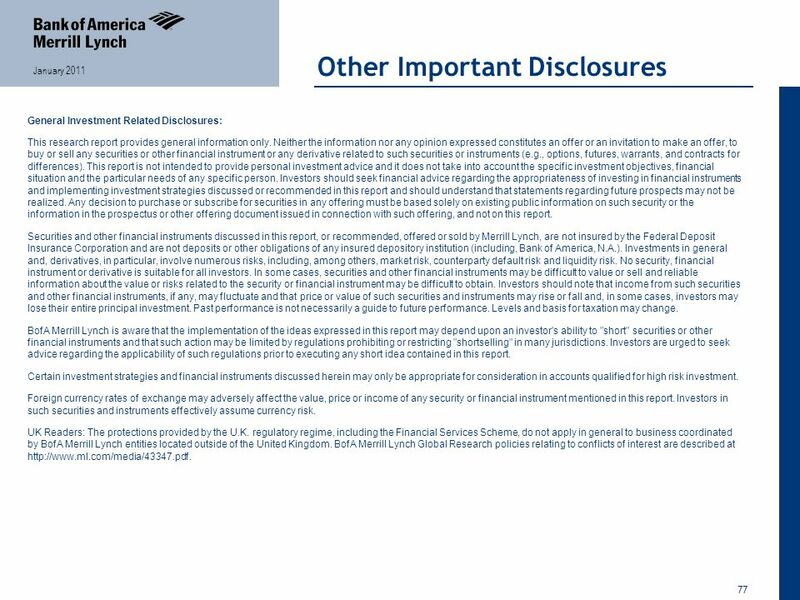 UK Readers: The protections provided by the U.K. regulatory regime, including the Financial Services Scheme, do not apply in general to business coordinated by BofA Merrill Lynch entities located outside of the United Kingdom. BofA Merrill Lynch Global Research policies relating to conflicts of interest are described at http://www.ml.com/media/43347.pdf. 78 78 January 2011 Other Important Disclosures Officers of MLPF&S or one or more of its affiliates (other than research analysts) may have a financial interest in securities of the issuer(s) or in related investments. MLPF&S or one of its affiliates is a regular issuer of traded financial instruments linked to securities that may have been recommended in this report. MLPF&S or one of its affiliates may, at any time, hold a trading position (long or short) in the securities and financial instruments discussed in this report. 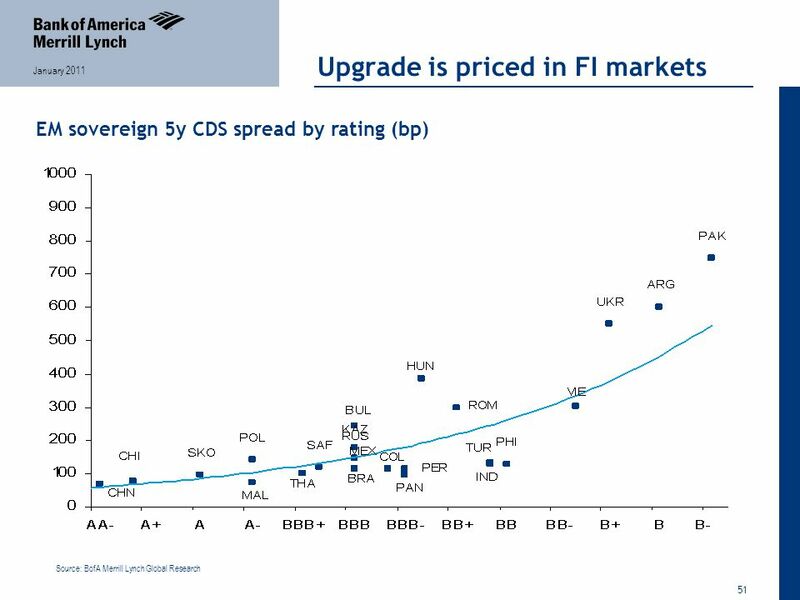 BofA Merrill Lynch, through business units other than BofA Merrill Lynch Global Research, may have issued and may in the future issue trading ideas or recommendations that are inconsistent with, and reach different conclusions from, the information presented in this report. 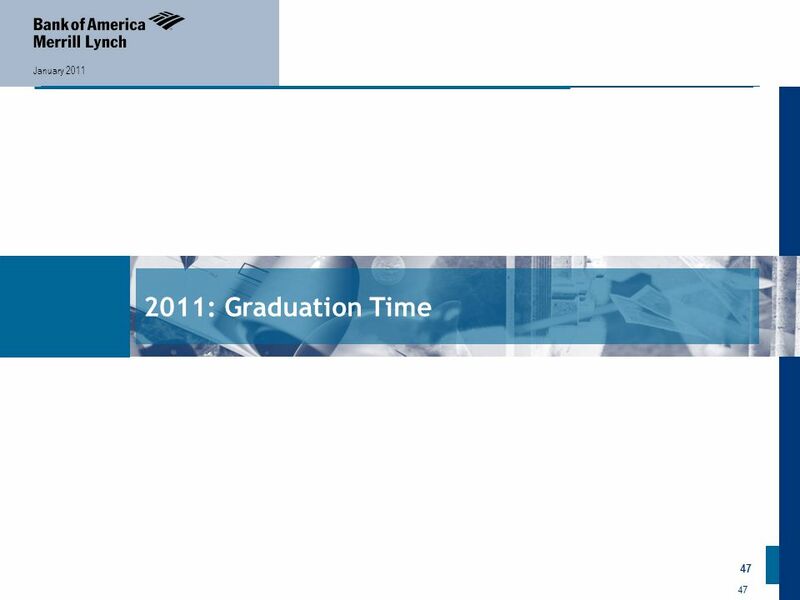 Such ideas or recommendations reflect the different time frames, assumptions, views and analytical methods of the persons who prepared them, and BofA Merrill Lynch is under no obligation to ensure that such other trading ideas or recommendations are brought to the attention of any recipient of this report. In the event that the recipient received this report pursuant to a contract between the recipient and MLPF&S for the provision of research services for a separate fee, and in connection therewith MLPF&S may be deemed to be acting as an investment adviser, such status relates, if at all, solely to the person with whom MLPF&S has contracted directly and does not extend beyond the delivery of this report (unless otherwise agreed specifically in writing by MLPF&S). MLPF&S is and continues to act solely as a broker-dealer in connection with the execution of any transactions, including transactions in any securities mentioned in this report. Copyright and General Information regarding Research Reports: Copyright 2011 Merrill Lynch, Pierce, Fenner & Smith Incorporated. All rights reserved. This research report is prepared for the use of BofA Merrill Lynch clients and may not be redistributed, retransmitted or disclosed, in whole or in part, or in any form or manner, without the express written consent of BofA Merrill Lynch. 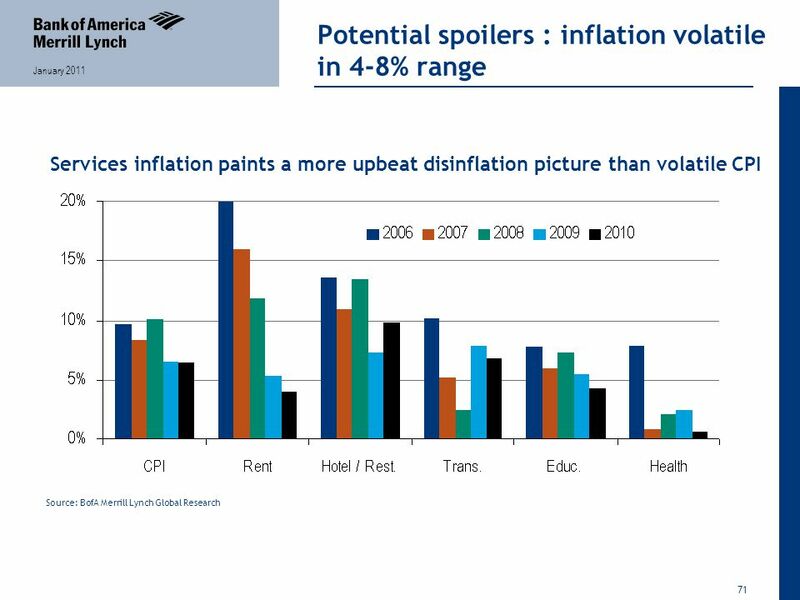 BofA Merrill Lynch research reports are distributed simultaneously to internal and client websites and other portals by BofA Merrill Lynch and are not publicly- available materials. Any unauthorized use or disclosure is prohibited. Receipt and review of this research report constitutes your agreement not to redistribute, retransmit, or disclose to others the contents, opinions, conclusion, or information contained in this report (including any investment recommendations, estimates or price targets) without first obtaining expressed permission from an authorized officer of BofA Merrill Lynch. 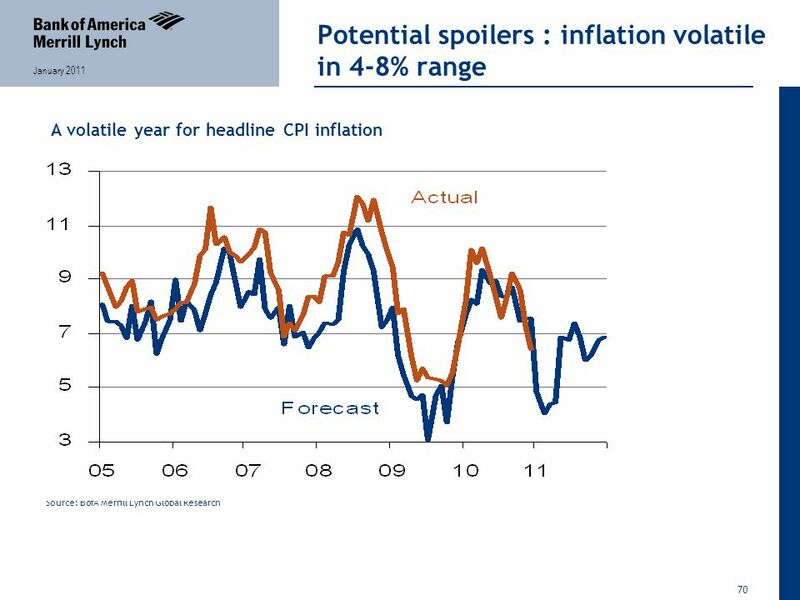 Materials prepared by BofA Merrill Lynch Global Research personnel are based on public information. Facts and views presented in this material have not been reviewed by, and may not reflect information known to, professionals in other business areas of BofA Merrill Lynch, including investment banking personnel. 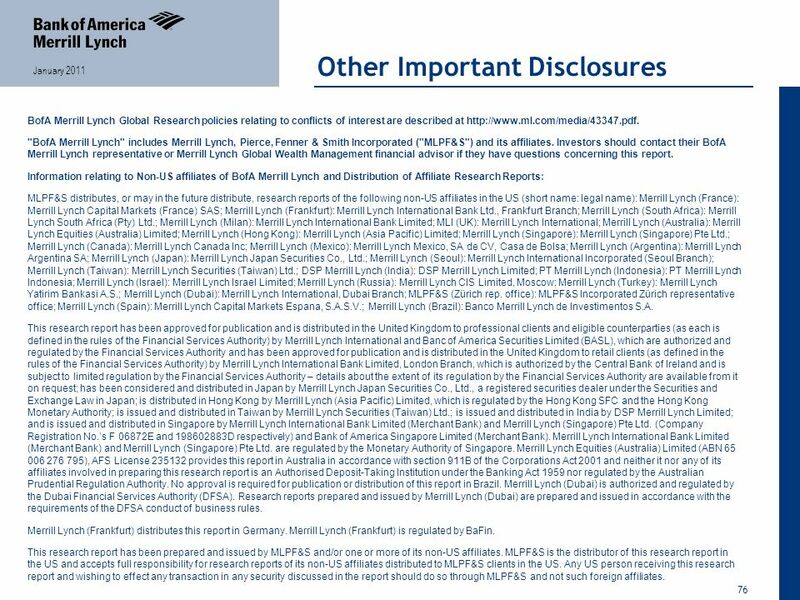 BofA Merrill Lynch has established information barriers between BofA Merrill Lynch Global Research and certain business groups. 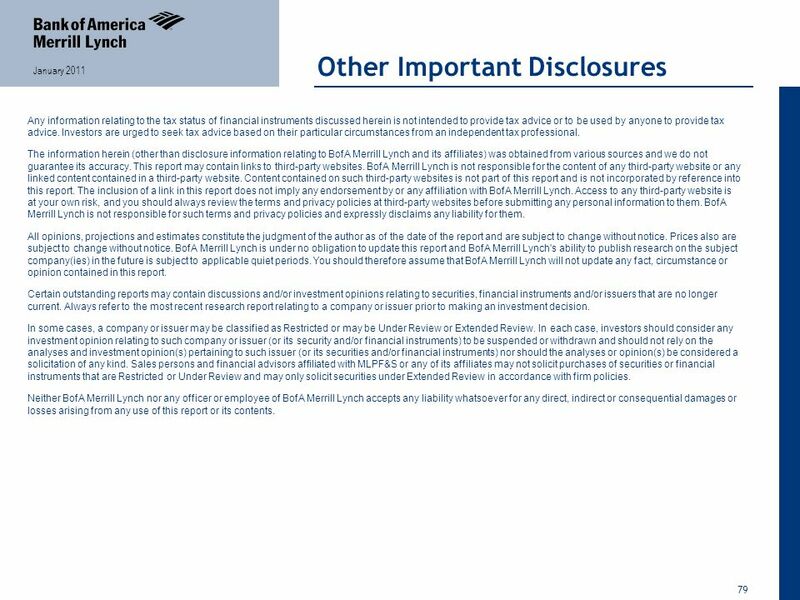 As a result, BofA Merrill Lynch does not disclose certain client relationships with, or compensation received from, such companies in research reports. To the extent this report discusses any legal proceeding or issues, it has not been prepared as nor is it intended to express any legal conclusion, opinion or advice. Investors should consult their own legal advisers as to issues of law relating to the subject matter of this report. BofA Merrill Lynch Global Research personnel’s knowledge of legal proceedings in which any BofA Merrill Lynch entity and/or its directors, officers and employees may be plaintiffs, defendants, co-defendants or co-plaintiffs with or involving companies mentioned in this report is based on public information. Facts and views presented in this material that relate to any such proceedings have not been reviewed by, discussed with, and may not reflect information known to, professionals in other business areas of BofA Merrill Lynch in connection with the legal proceedings or matters relevant to such proceedings. 79 79 January 2011 Other Important Disclosures Any information relating to the tax status of financial instruments discussed herein is not intended to provide tax advice or to be used by anyone to provide tax advice. Investors are urged to seek tax advice based on their particular circumstances from an independent tax professional. The information herein (other than disclosure information relating to BofA Merrill Lynch and its affiliates) was obtained from various sources and we do not guarantee its accuracy. This report may contain links to third-party websites. BofA Merrill Lynch is not responsible for the content of any third-party website or any linked content contained in a third-party website. Content contained on such third-party websites is not part of this report and is not incorporated by reference into this report. 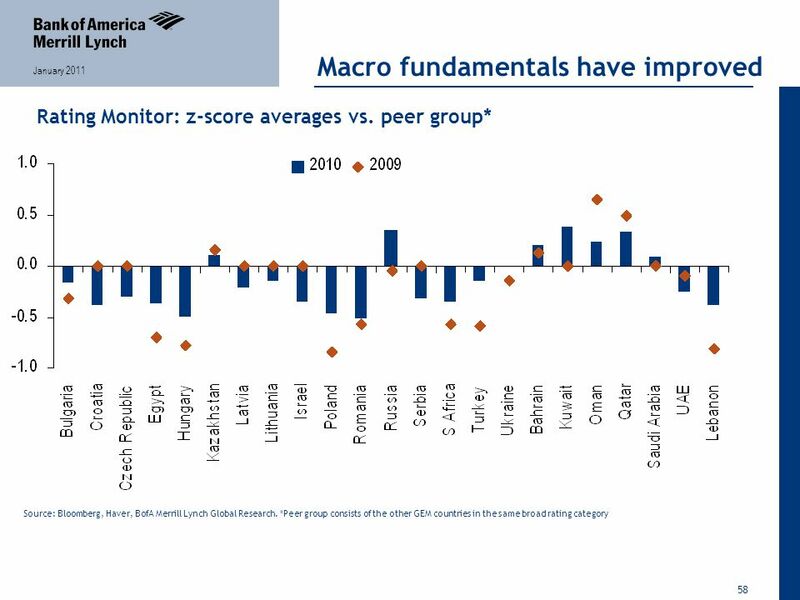 The inclusion of a link in this report does not imply any endorsement by or any affiliation with BofA Merrill Lynch. Access to any third-party website is at your own risk, and you should always review the terms and privacy policies at third-party websites before submitting any personal information to them. BofA Merrill Lynch is not responsible for such terms and privacy policies and expressly disclaims any liability for them. All opinions, projections and estimates constitute the judgment of the author as of the date of the report and are subject to change without notice. Prices also are subject to change without notice. 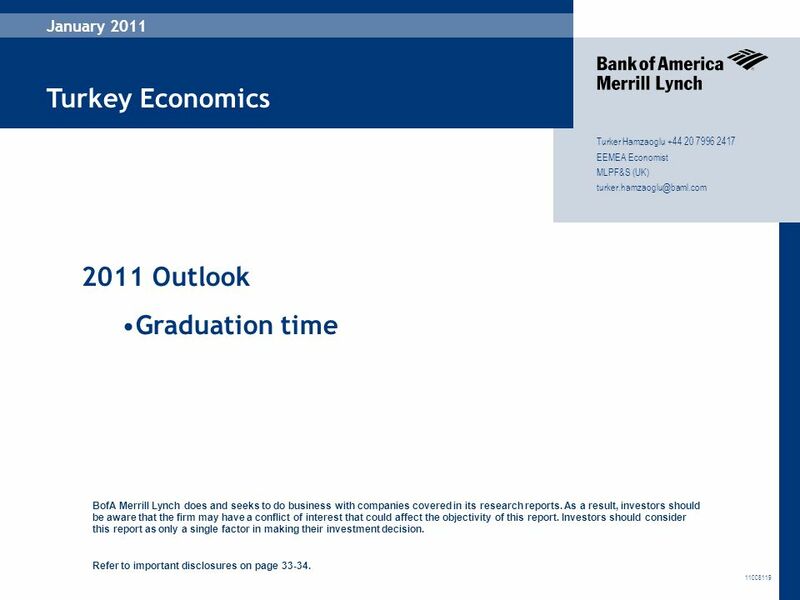 BofA Merrill Lynch is under no obligation to update this report and BofA Merrill Lynch's ability to publish research on the subject company(ies) in the future is subject to applicable quiet periods. 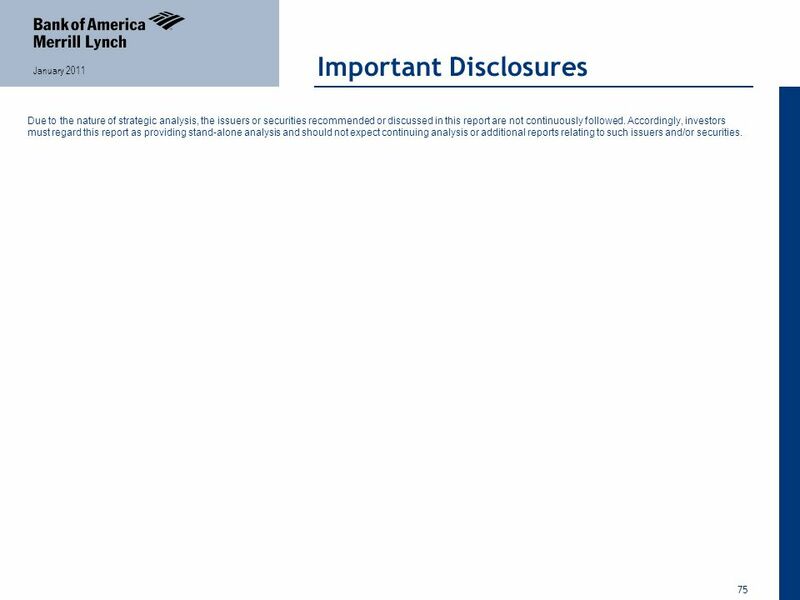 You should therefore assume that BofA Merrill Lynch will not update any fact, circumstance or opinion contained in this report. Certain outstanding reports may contain discussions and/or investment opinions relating to securities, financial instruments and/or issuers that are no longer current. Always refer to the most recent research report relating to a company or issuer prior to making an investment decision. In some cases, a company or issuer may be classified as Restricted or may be Under Review or Extended Review. In each case, investors should consider any investment opinion relating to such company or issuer (or its security and/or financial instruments) to be suspended or withdrawn and should not rely on the analyses and investment opinion(s) pertaining to such issuer (or its securities and/or financial instruments) nor should the analyses or opinion(s) be considered a solicitation of any kind. Sales persons and financial advisors affiliated with MLPF&S or any of its affiliates may not solicit purchases of securities or financial instruments that are Restricted or Under Review and may only solicit securities under Extended Review in accordance with firm policies. Neither BofA Merrill Lynch nor any officer or employee of BofA Merrill Lynch accepts any liability whatsoever for any direct, indirect or consequential damages or losses arising from any use of this report or its contents. 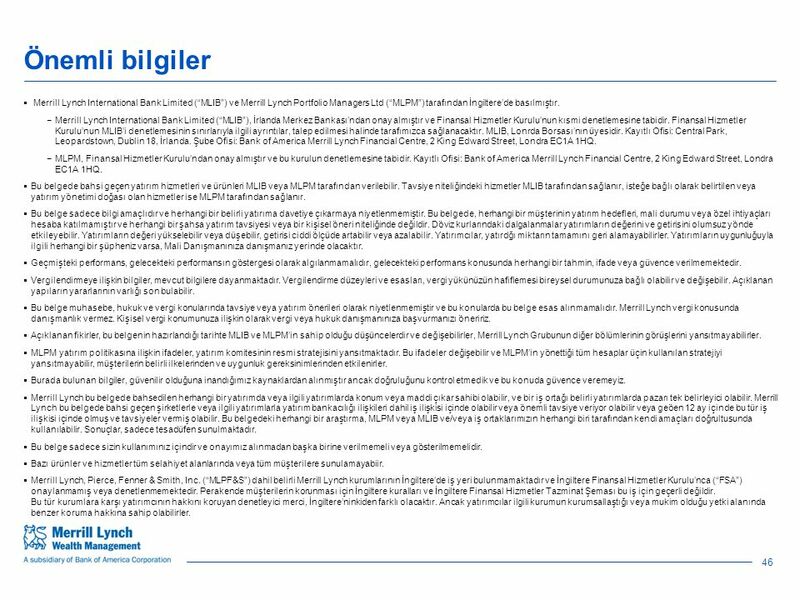 80 46 Önemli bilgiler  Merrill Lynch International Bank Limited (“MLIB”) ve Merrill Lynch Portfolio Managers Ltd (“MLPM”) tarafından İngiltere’de basılmıştır. 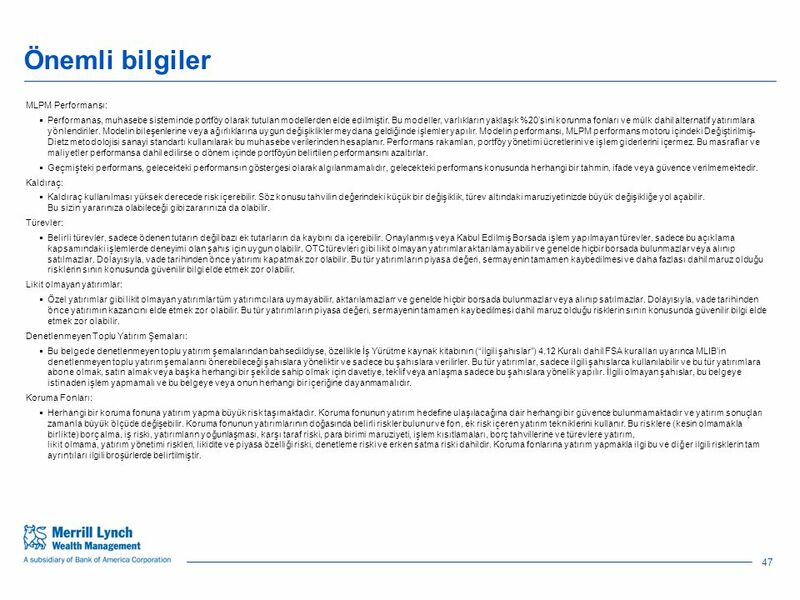 −Merrill Lynch International Bank Limited (“MLIB”), İrlanda Merkez Bankası’ndan onay almıştır ve Finansal Hizmetler Kurulu’nun kısmi denetlemesine tabidir. 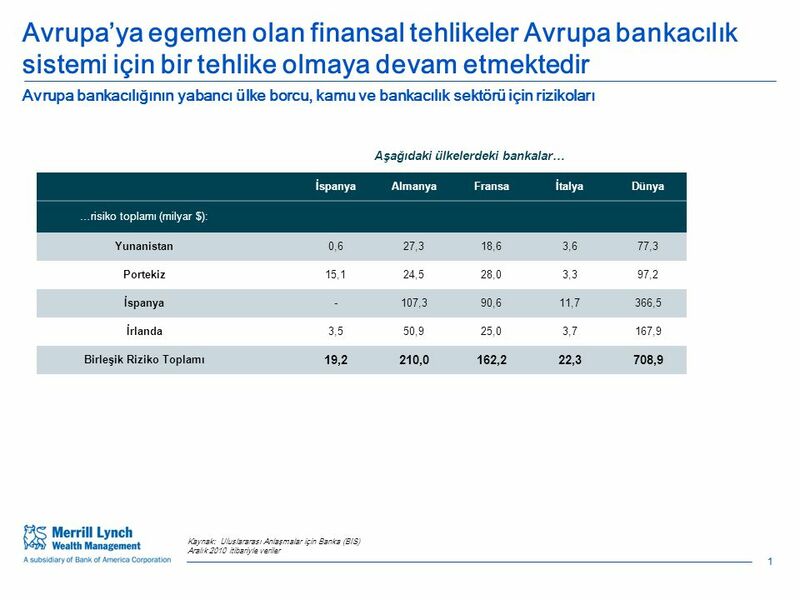 Finansal Hizmetler Kurulu’nun MLIB’i denetlemesinin sınırlarıyla ilgili ayrıntılar, talep edilmesi halinde tarafımızca sağlanacaktır. 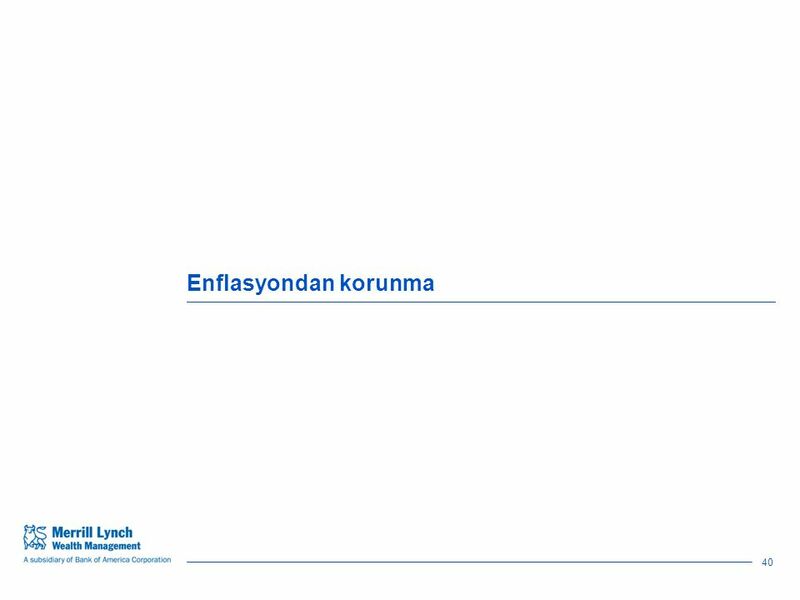 MLIB, Lonrda Borsası’nın üyesidir. Kayıtlı Ofisi: Central Park, Leopardstown, Dublin 18, İrlanda. 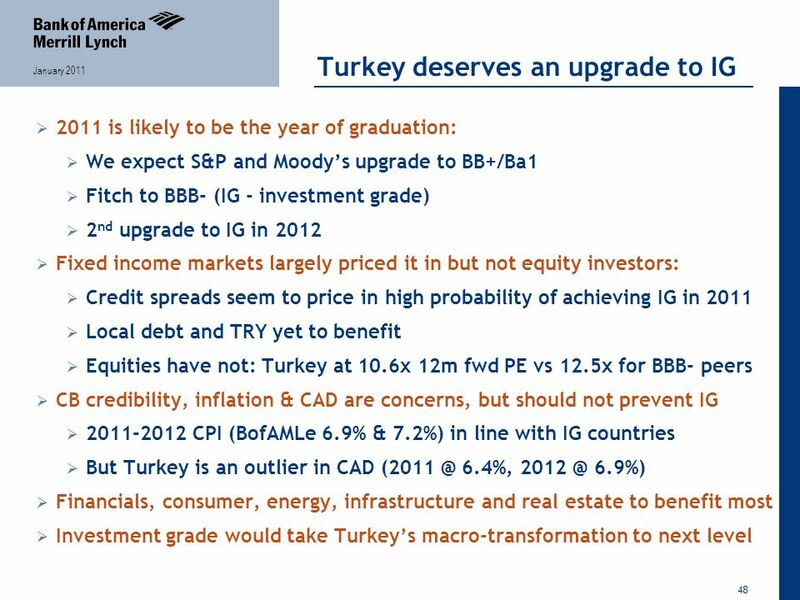 Şube Ofisi: Bank of America Merrill Lynch Financial Centre, 2 King Edward Street, Londra EC1A 1HQ. −MLPM, Finansal Hizmetler Kurulu’ndan onay almıştır ve bu kurulun denetlemesine tabidir. 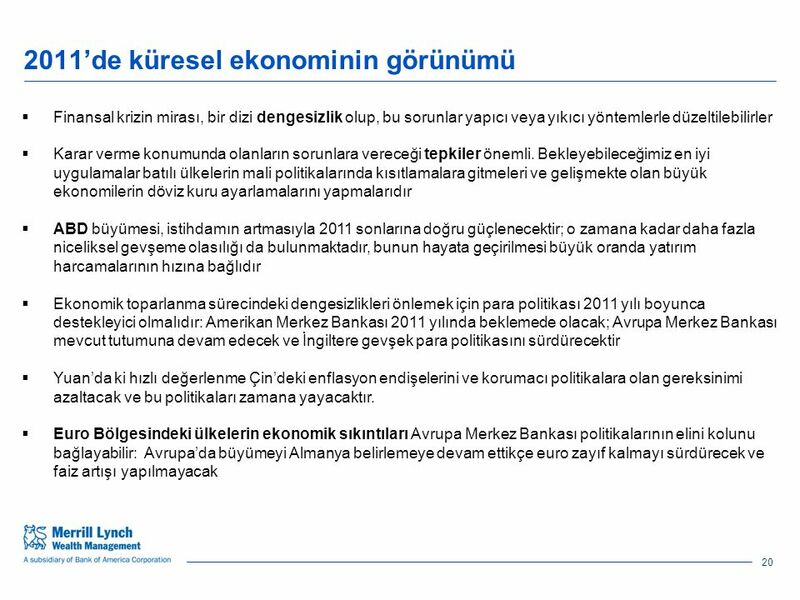 Kayıtlı Ofisi: Bank of America Merrill Lynch Financial Centre, 2 King Edward Street, Londra EC1A 1HQ.  Bu belgede bahsi geçen yatırım hizmetleri ve ürünleri MLIB veya MLPM tarafından verilebilir. 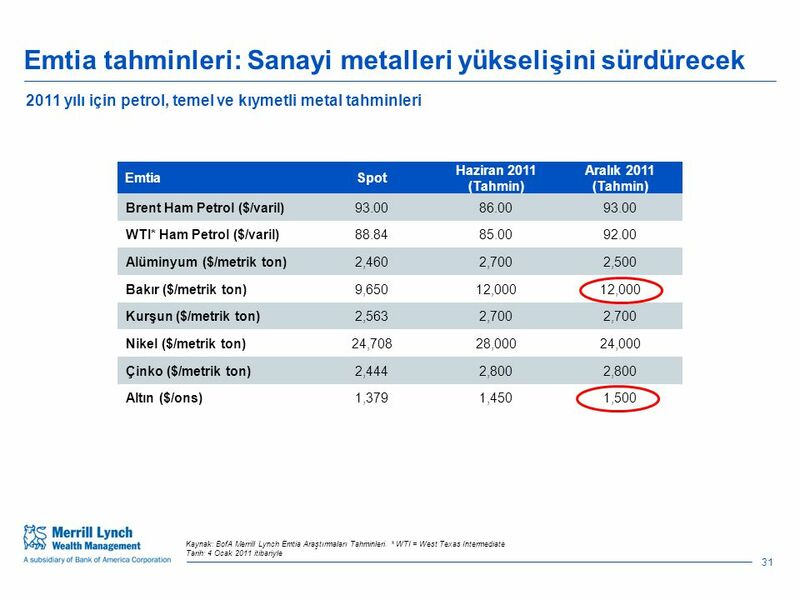 Tavsiye niteliğindeki hizmetler MLIB tarafından sağlanır, isteğe bağlı olarak belirtilen veya yatırım yönetimi doğası olan hizmetler ise MLPM tarafından sağlanır.  Bu belge sadece bilgi amaçlıdır ve herhangi bir belirli yatırıma davetiye çıkarmaya niyetlenmemiştir. Bu belgede, herhangi bir müşterinin yatırım hedefleri, mali durumu veya özel ihtiyaçları hesaba katılmamıştır ve herhangi bir şahsa yatırım tavsiyesi veya bir kişisel öneri niteliğinde değildir. Döviz kurlarındaki dalgalanmalar yatırımların değerini ve getirisini olumsuz yönde etkileyebilir. Yatırımların değeri yükselebilir veya düşebilir, getirisi ciddi ölçüde artabilir veya azalabilir. Yatırımcılar, yatırdğı miktarın tamamını geri alamayabilirler. 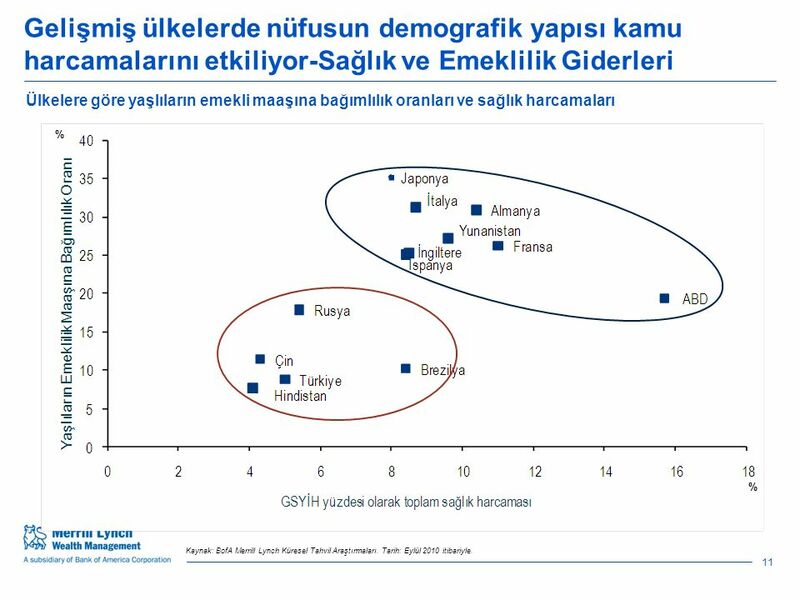 Yatırımların uygunluğuyla ilgili herhangi bir şüpheniz varsa, Mali Danışmanınıza danışmanız yerinde olacaktır. 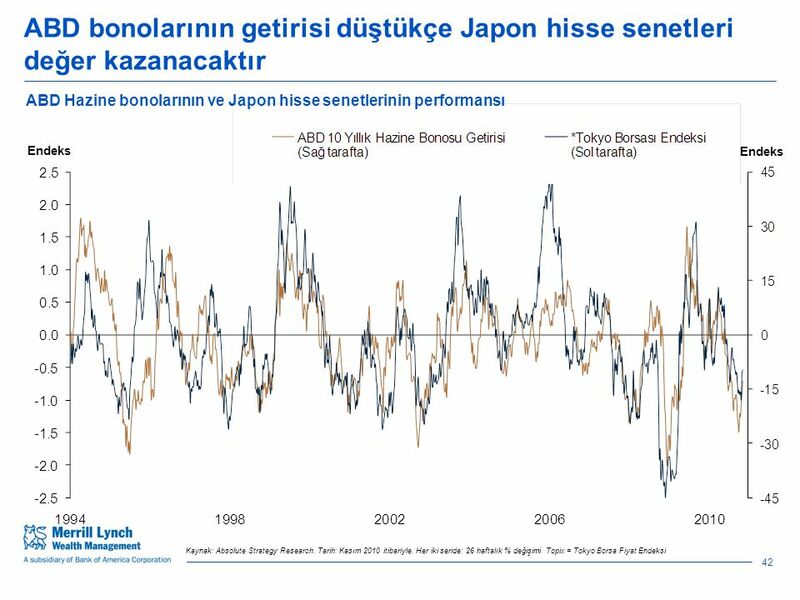  Geçmişteki performans, gelecekteki performansın göstergesi olarak algılanmamalıdır, gelecekteki performans konusunda herhangi bir tahmin, ifade veya güvence verilmemektedir.  Vergilendirmeye ilişkin bilgiler, mevcut bilgilere dayanmaktadır. 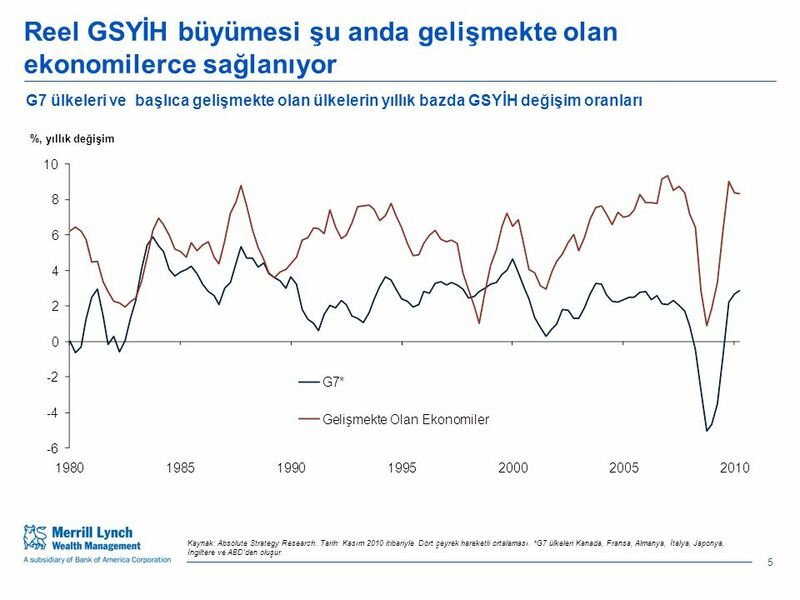 Vergilendirme düzeyleri ve esasları, vergi yükünüzün hafiflemesi bireysel durumunuza bağlı olabilir ve değişebilir. Açıklanan yapıların yararlarının varlığı son bulabilir.  Bu belge muhasebe, hukuk ve vergi konularında tavsiye veya yatırım önerileri olarak niyetlenmemiştir ve bu konularda bu belge esas alınmamalıdır. 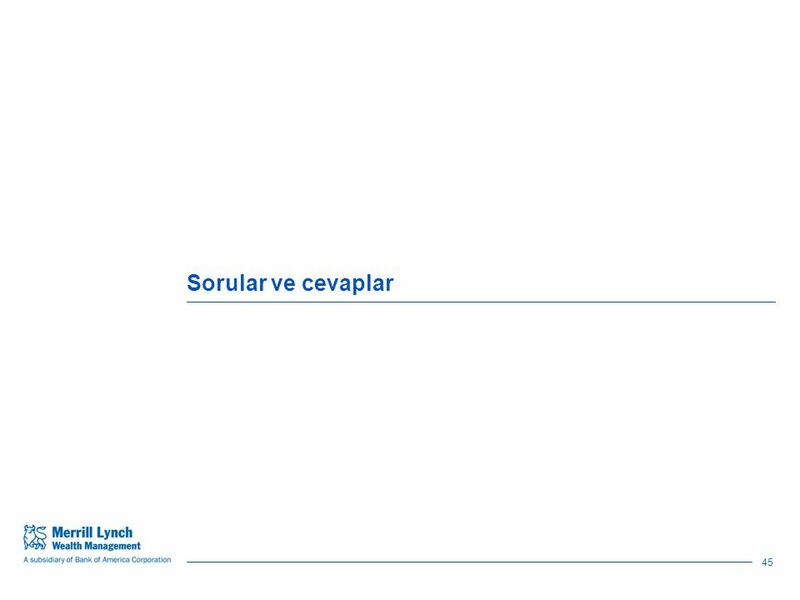 Merrill Lynch vergi konusunda danışmanlık vermez. Kişisel vergi konumunuza ilişkin olarak vergi veya hukuk danışmanınıza başvurmanızı öneririz. 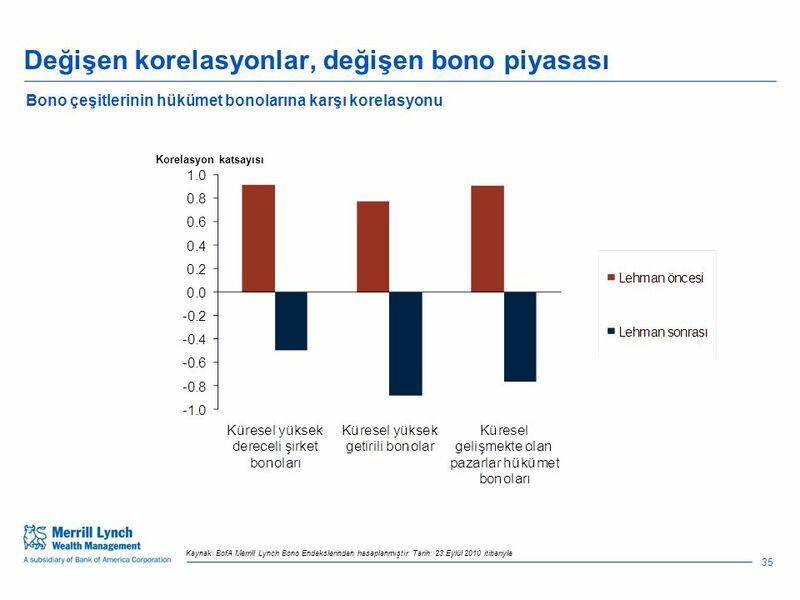  Açıklanan fikirler, bu belgenin hazırlandığı tarihte MLIB ve MLPM’in sahip olduğu düşüncelerdir ve değişebilirler, Merrill Lynch Grubunun diğer bölümlerinin görüşlerini yansıtmayabilirler.  MLPM yatırım politikasına ilişkin ifadeler, yatırım komitesinin resmi stratejisini yansıtmaktadır. 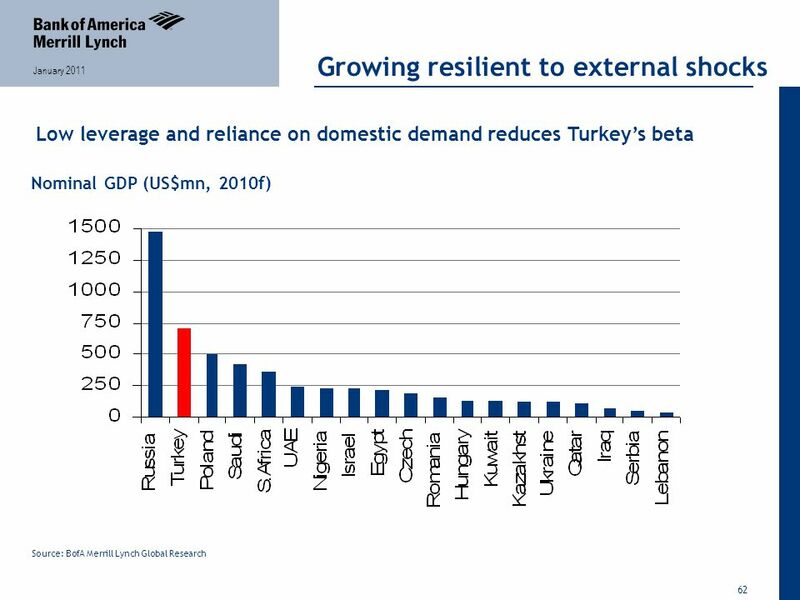 Bu ifadeler değişebilir ve MLPM’in yönettiği tüm hesaplar üçin kullanılan stratejiyi yansıtmayabilir, müşterilerin belirli ilkelerinden ve uygunluk gereksinimlerinden etkilenirler.  Burada bulunan bilgiler, güvenilir olduğuna inandığımız kaynaklardan alınmıştır ancak doğruluğunu kontrol etmedik ve bu konuda güvence veremeyiz. 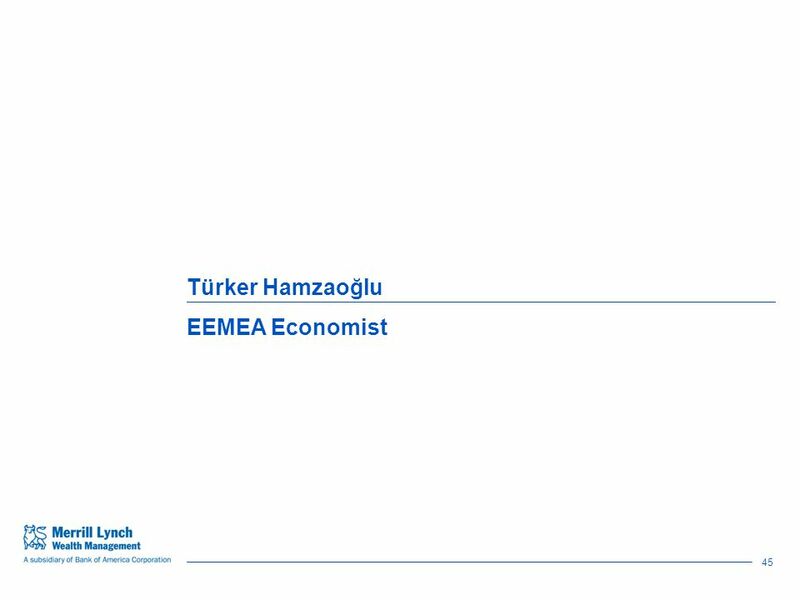  Merrill Lynch bu belgede bahsedilen herhangi bir yatırımda veya ilgili yatırımlarda konum veya maddi çıkar sahibi olabilir, ve bir iş ortağı belirli yatırımlarda pazarı tek belirleyici olabilir. 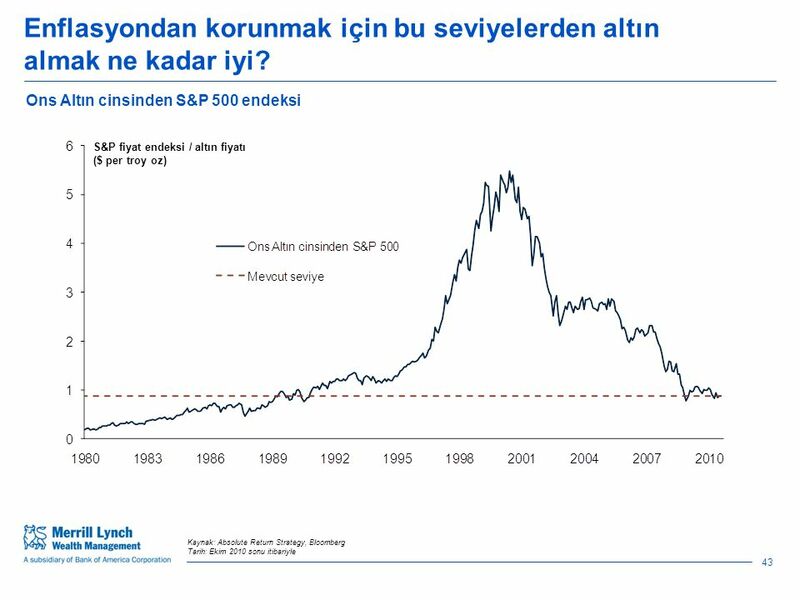 Merrill Lynch bu belgede bahsi geçen şirketlerle veya ilgili yatırımlarla yatırım bankacılığı ilişkileri dahil iş ilişkisi içinde olabilir veya önemli tavsiye veriyor olabilir veya geöen 12 ay içinde bu tür iş ilişkisi içinde olmuş ve tavsiyeler vermiş olabilir. Bu belgedeki herhangi bir araştırma, MLPM veya MLIB ve/veya iş ortaklarımızın herhangi biri tarafından kendi amaçları doğrultusunda kullanılabilir. Sonuçlar, sadece tesadüfen sunulmaktadır.  Bu belge sadece sizin kullanımınız içindir ve onayımız alınmadan başka birine verilmemeli veya gösterilmemelidir.  Bazı ürünler ve hizmetler tüm selahiyet alanlarında veya tüm müşterilere sunulamayabiir. 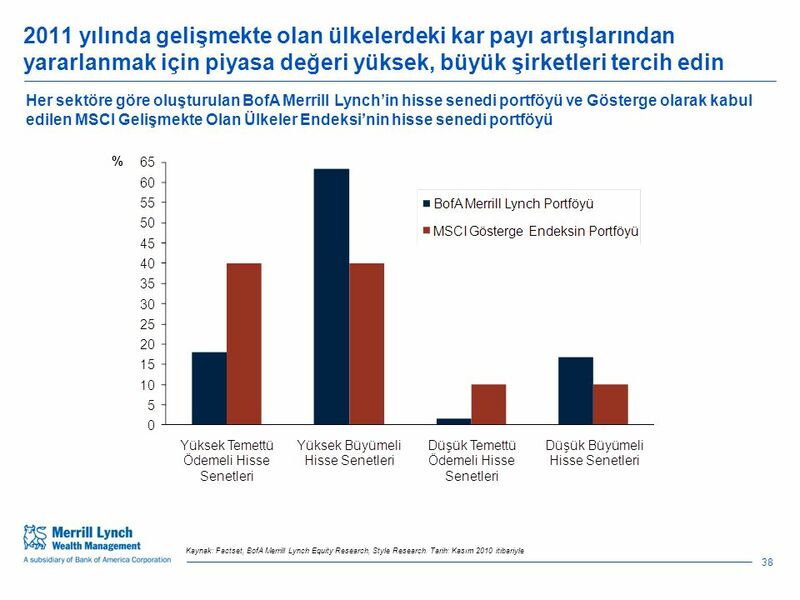  Merrill Lynch, Pierce, Fenner & Smith, Inc. (“MLPF&S”) dahil belirli Merrill Lynch kurumlarının İngiltere’de iş yeri bulunmamaktadır ve İngiltere Finansal Hizmetler Kurulu’nca (“FSA”) onaylanmamış veya denetlenmemektedir. 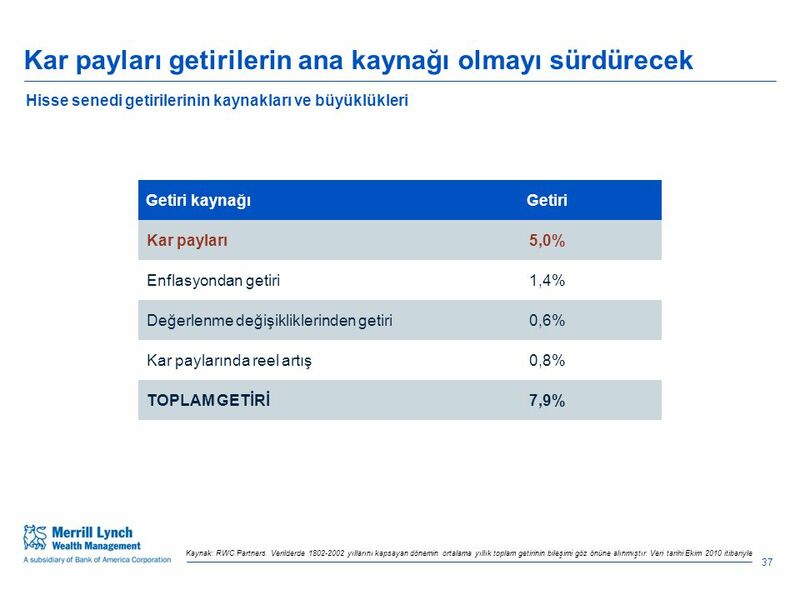 Perakende müşterilerin korunması için İngiltere kuralları ve İngiltere Finansal Hizmetler Tazminat Şeması bu iş için geçerli değildir. Bu tür kurumlara karşı yatırımcının hakkını koruyan denetleyici merci, İngiltere’ninkiden farklı olacaktır. Ancak yatırımcılar ilgili kurumun kurumsallaştığı veya mukim olduğu yetki alanında benzer koruma hakkına sahip olabilirler. 81 47 Önemli bilgiler MLPM Performansı:  Performanas, muhasebe sisteminde portföy olarak tutulan modellerden elde edilmiştir. 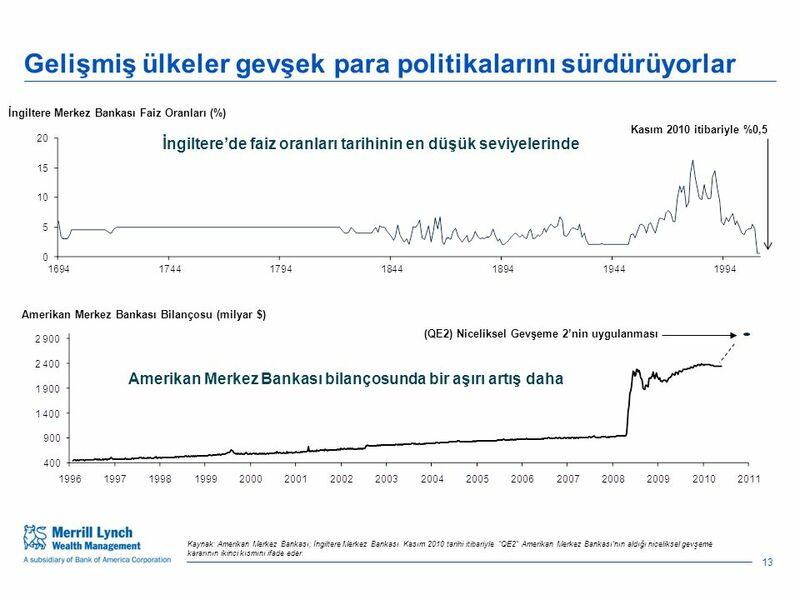 Bu modeller, varlıkların yaklaşık %20’sini korunma fonları ve mülk dahil alternatif yatırımlara yönlendiriler. Modelin bileşenlerine veya ağırlıklarına uygun değişiklikler meydana geldiğinde işlemler yapılır. 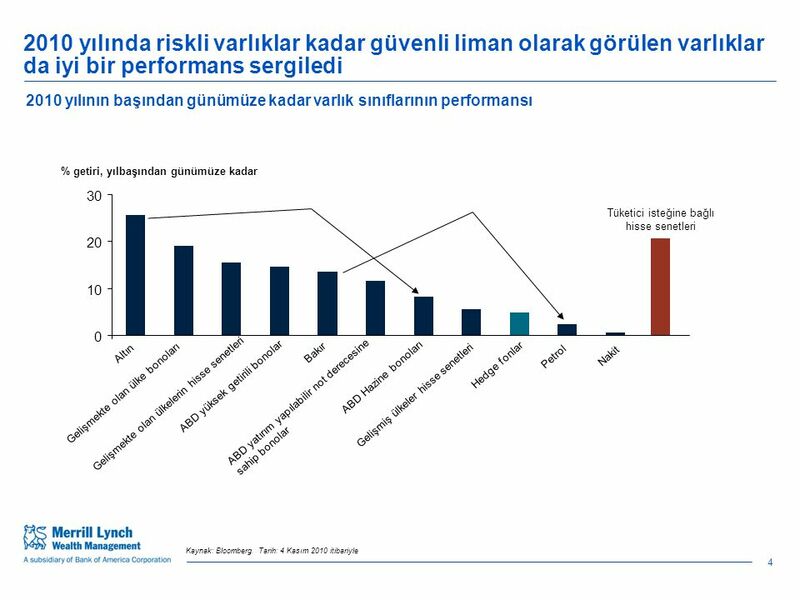 Modelin performansı, MLPM performans motoru içindeki Değiştirilmiş- Dietz metodolojisi sanayi standartı kullanılarak bu muhasebe verilerinden hesaplanır. 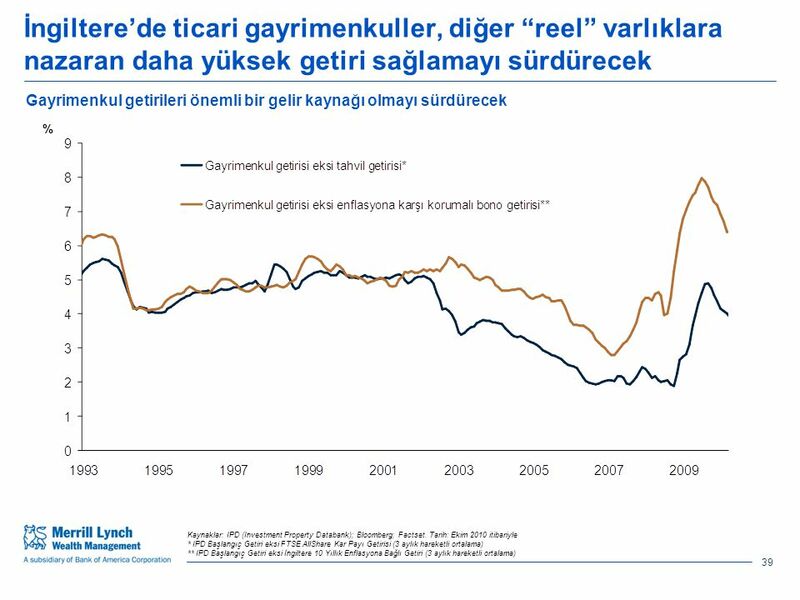 Performans rakamları, portföy yönetimi ücretlerini ve işlem giderlerini içermez. 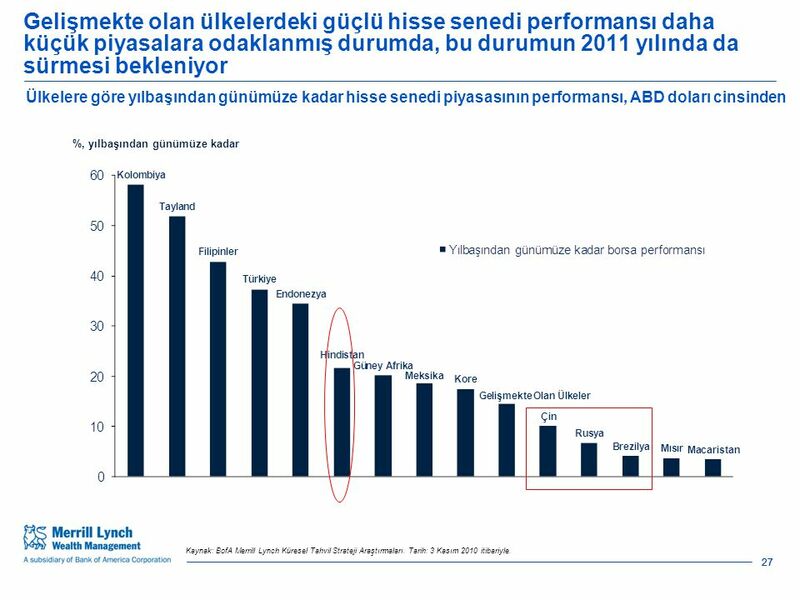 Bu masraflar ve maliyetler performansa dahil edilirse o dönem içinde portföyün belirtilen performansını azaltırlar.  Geçmişteki performans, gelecekteki performansın göstergesi olarak algılanmamalıdır, gelecekteki performans konusunda herhangi bir tahmin, ifade veya güvence verilmemektedir. 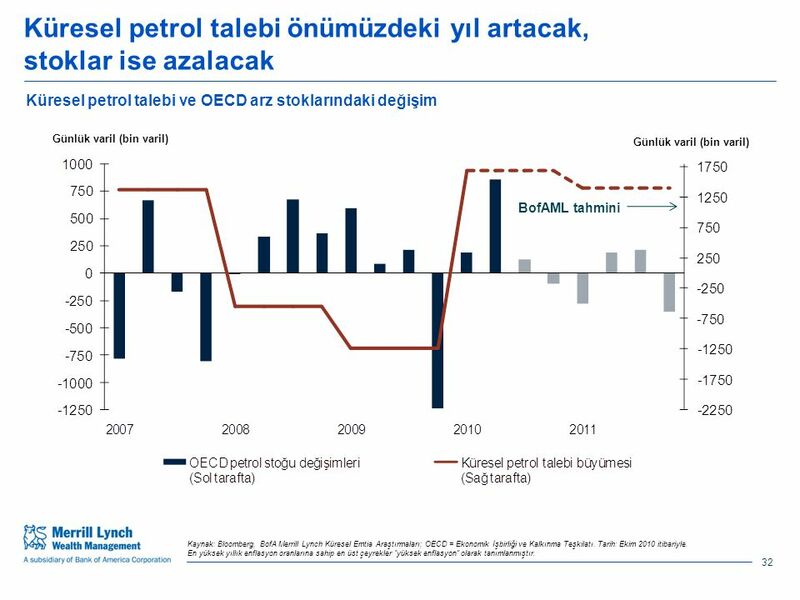 Kaldıraç:  Kaldıraç kullanılması yüksek derecede risk içerebilir. Söz konusu tahvilin değerindeki küçük bir değişiklik, türev altındaki maruziyetinizde büyük değişikliğe yol açabilir. Bu sizin yararınıza olabileceği gibi zararınıza da olabilir. Türevler:  Belirli türevler, sadece ödenen tutarın değil bazı ek tutarların da kaybını da içerebilir. Onaylanmış veya Kabul Edilmiş Borsada işlem yapılmayan türevler, sadece bu açıklama kapsamındaki işlemlerde deneyimi olan şahıs için uygun olabilir. 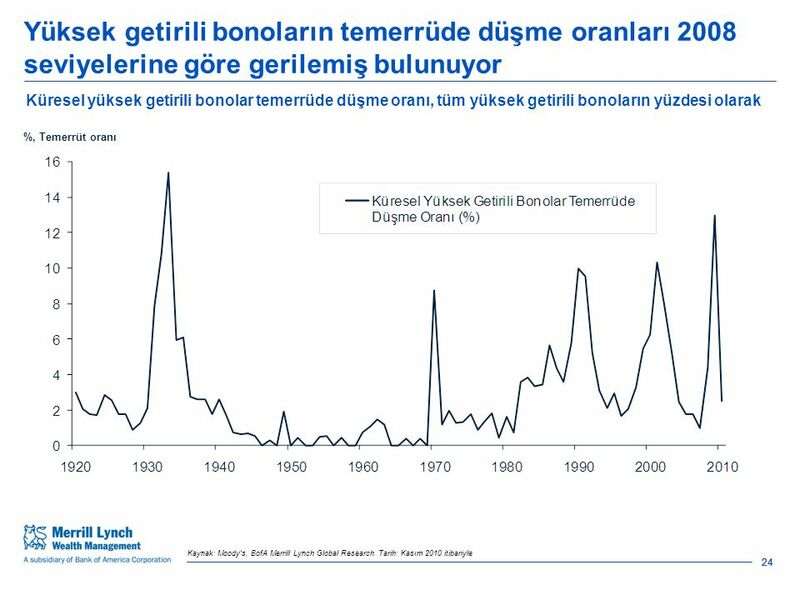 OTC türevleri gibi likit olmayan yatırımlar aktarılamayabilir ve genelde hiçbir borsada bulunmazlar veya alınıp satılmazlar. Dolayısıyla, vade tarihinden önce yatırımı kapatmak zor olabilir. Bu tür yatırımların piyasa değeri, sermayenin tamamen kaybedilmesi ve daha fazlası dahil maruz olduğu risklerin sınırı konusunda güvenilir bilgi elde etmek zor olabilir. 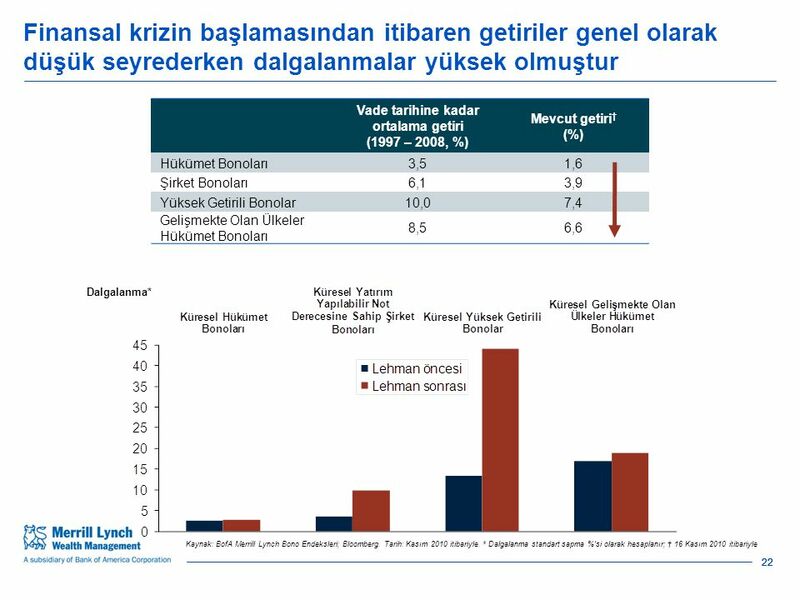 Likit olmayan yatırımlar:  Özel yatırımlar gibi likit olmayan yatırımlar tüm yatırımcılara uymayabilir, aktarılamazlarr ve genelde hiçbir borsada bulunmazlar veya alınıp satılmazlar. 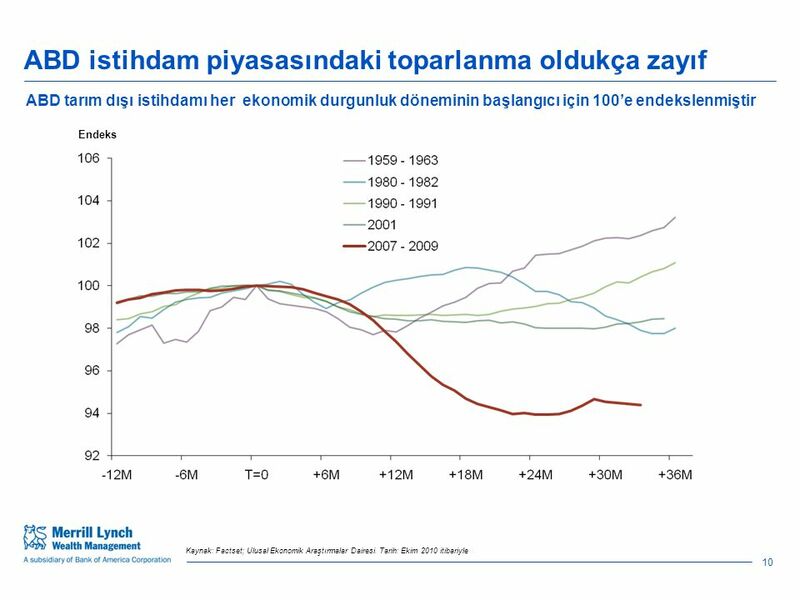 Dolayısıyla, vade tarihinden önce yatırımın kazancını elde etmek zor olabilir. Bu tür yatırımların piyasa değeri, sermayenin tamamen kaybedilmesi dahil maruz olduğu risklerin sınırı konusunda güvenilir bilgi elde etmek zor olabilir. Denetlenmeyen Toplu Yatırım Şemaları:  Bu belgede denetlenmeyen toplu yatırım şemalarından bahsedildiyse, özellikle İş Yürütme kaynak kitabının (“ilgili şahıslar”) 4.12 Kuralı dahil FSA kuralları uyarınca MLIB’in denetlenmeyen toplu yatırım şemalarını önerebileceği şahıslara yöneliktir ve sadece bu şahıslara verilirler. Bu tür yatırımlar, sadece ilgili şahıslarca kullanılabilir ve bu tür yatırımlara abone olmak, satın almak veya başka herhangi bir şekilde sahip olmak için davetiye, teklif veya anlaşma sadece bu şahıslara yönelik yapılır. İlgili olmayan şahıslar, bu belgeye istinaden işlem yapmamalı ve bu belgeye veya onun herhangi bir içeriğine dayanmamalıdır. Koruma Fonları:  Herhangi bir koruma fonuna yatırım yapma büyük risk taşımaktadır. 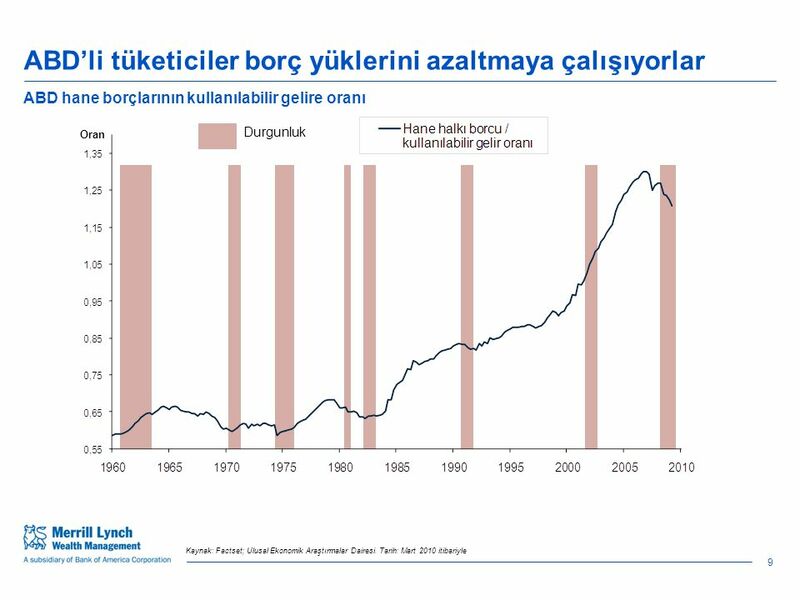 Koruma fonunun yatırım hedefine ulaşılacağına dair herhangi bir güvence bulunmamaktadır ve yatırım sonuçları zamanla büyük ölçüde değişebilir. 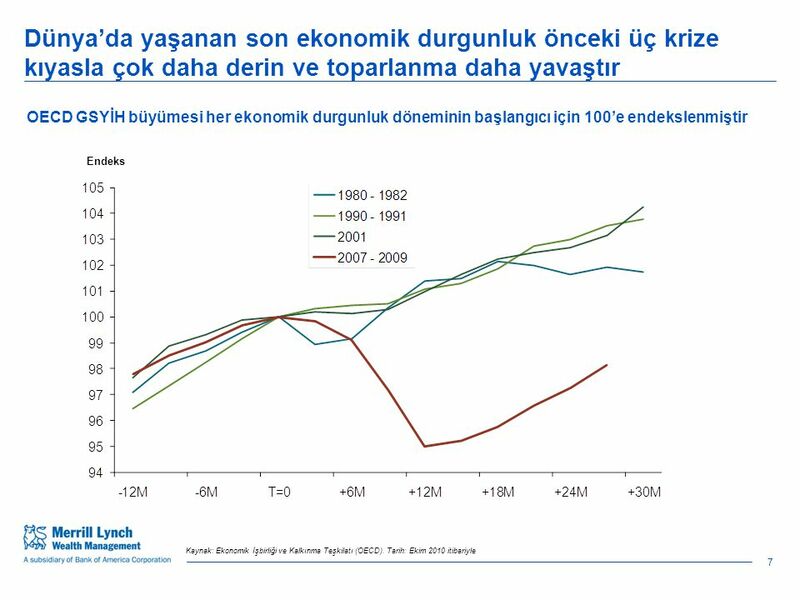 Koruma fonunun yatırımlarının doğasında belirli riskler bulunur ve fon, ek risk içeren yatırım tekniklerini kullanır. Bu risklere (kesin olmamakla birlikte) borç alma, iş riski, yatırımların yoğunlaşması, karşı taraf riski, para birimi maruziyeti, işlem kısıtlamaları, borç tahvillerine ve türevlere yatırım, likit olmama, yatırım yönetimi riskleri, likidite ve piyasa özelliği riski, denetleme riski ve erken satma riski dahildir. 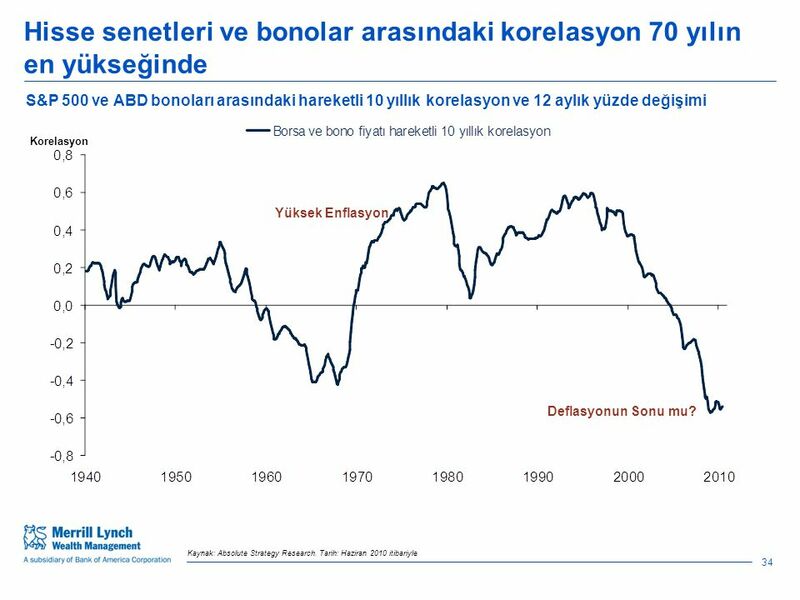 Koruma fonlarına yatırım yapmakla ilgi bu ve diğer ilgili risklerin tam ayrıntıları ilgili broşürlerde belirtilmiştir. 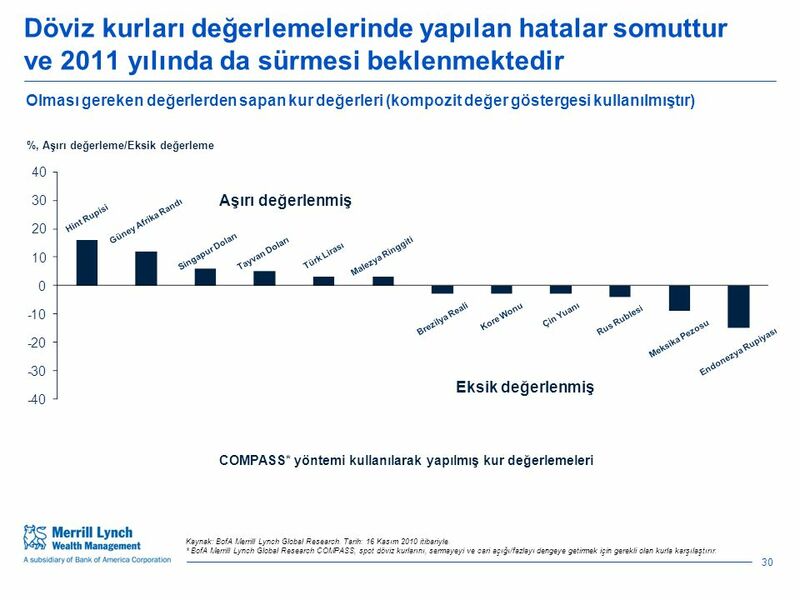 © 2011 IFRS Foundation 1 IFRS for SMEs Konu 2.5(b) Test ve Tartışma Varlıklar Bölümler 14 &15. A. Yasal Alt Yapı  5684 Sayılı Sigortacılık Kanunu: tarihinde RG’de yayımlanmıştır. 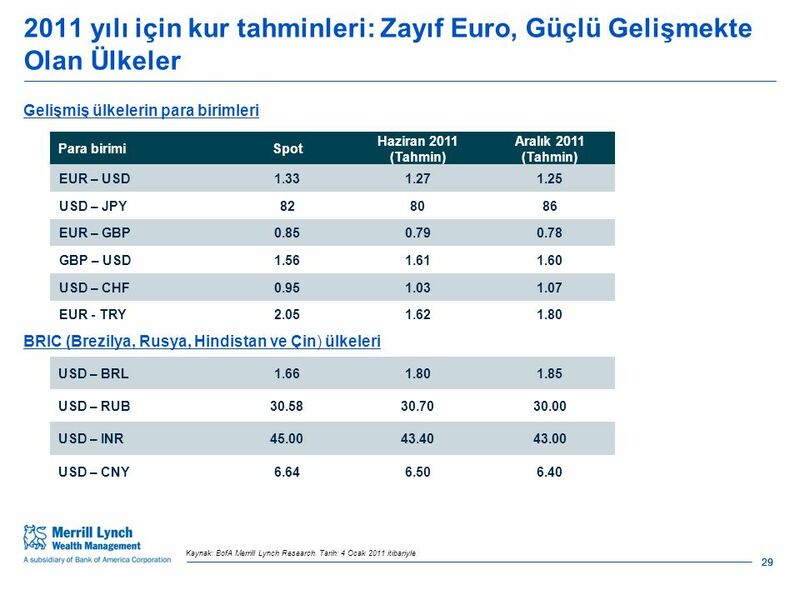  İkramiye ve İndirimler Karşılığı Hesabı: 07 Ağustos 2007. 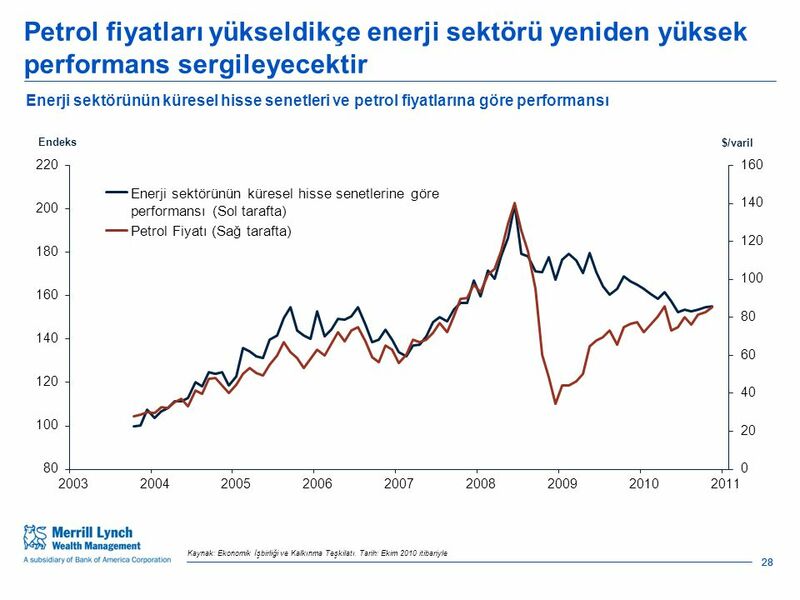 Küresel Ekonomik Kriz Sonrası Enerji Piyasalarındaki Oluşum ve Gelişmeler Yavuz Aydın Direktör GE Energy Services Türkiye/Israil 13 Mayıs 2010 GE Energy. Erkin Işık | 2 Mart 2006 | 1 Getting you there. 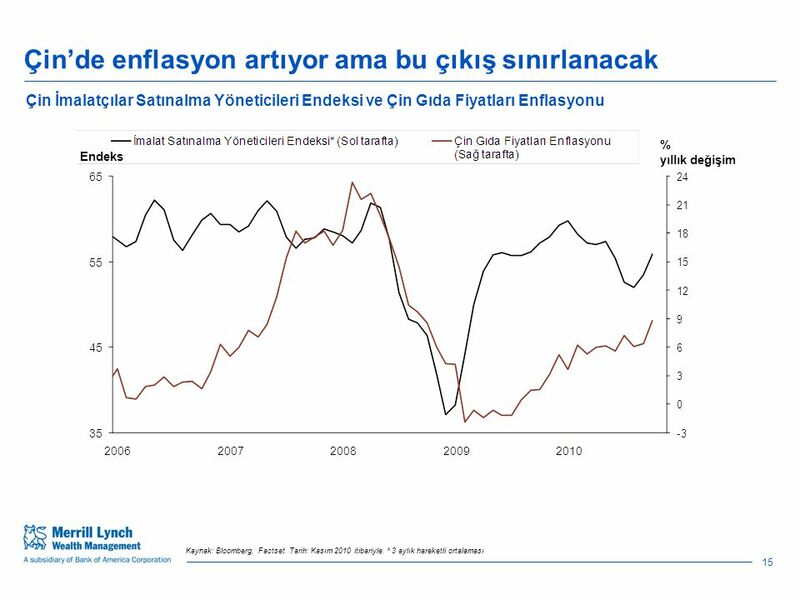 ENFLASYON* GİZLİ ŞİFRENİN PEŞİNDE * Ekonomi Çalışma Grubu’nda gerçekleştirilecek sunumların hazırlayan.